(A) 분자중에 적어도 두개의 지방족 불포화 결합을 함유하는 오르가노폴리실록산, (B) SiO 2 단위, R 3 n R 4 p SiO 0.5 단위 및 R 3 q R 4 r SiO 0.5 단위를 포함하는 수지 구조의 오르가노폴리실록산(상기 식에서, R 3 는 (A) a resin structure including at least two aliphatic unsaturated bond, an organopolysiloxane, (B) SiO 2 units, R 3 n R 4 p SiO 0.5 units and R 3 q R 4 r SiO 0.5 units containing in the molecule organopolysiloxane (the above formula, R 3 비닐 또는 알릴이고, R 4 는 지방족 불포화가 없는 1가 탄화수소기이고, n은 2 또는 3이고, p는 0 또는 1이고, n+p=3이고, q는 0 또는 1이고, r은 2 또는 3이고, q+r=3이다), (C) 분자중에 적어도 두개의 규소 원자-결합된 수소 원자를 갖는 오르가노하이드로겐폴리실록산, 및 (D) 백금 촉매를 포함하는 실리콘 고무 조성물은 우수한 고무적 성질 및 강도 특성을 가지고 표면 태크는 거의 없는 실리콘 고무로 경화된다. Is vinyl or allyl, R 4 is a monovalent hydrocarbon group free of aliphatic unsaturation, n is 2 or 3, p is 0 or 1, n + p = 3, q is 0 or 1, r is 2 or 3 and, q + r = 3 a), (C) at least two of the silicon atoms in the molecule - organohydrogenpolysiloxane, and (D) a silicone rubber composition comprising a platinum catalyst is excellent promising properties having bonded hydrogen atoms have the surface tack and strength of the cured silicone rubber as a few. 규소, 실리콘, 고무, 오르가노폴리실록산, 발광 소자, 반도체. Silicon, silicone, rubber, an organopolysiloxane, a light emitting device, the semiconductor. 도 1은 발광 소자가 절연 하우징에 다이 본딩되는 발광 반도체 장치를 장착하는 예시 표면의 개략적인 단면도이다. 1 is a schematic cross-sectional view of an example of mounting the light-emitting surface of the semiconductor device is a light emitting element is die-bonded to the insulating housing. 도 2는 발광 소자가 하우징을 통해 삽입된 리드 전극에 다이 본딩되는 발광 반도체 장치를 장착하는 또다른 예시 표면의 개략적인 단면도이다. Figure 2 is a schematic cross-sectional view of yet another example of surface mounting a light-emitting semiconductor device is a light emitting element is die-bonded to a lead electrode inserted through the housing. 도 3은 램프형 발광 반도체 장치로서 LED의 개략적인 단면도이다. Figure 3 is a schematic cross-sectional view of the LED lamp as a light-emitting semiconductor device. 본 발명은 부가 경화형의 실리콘 고무 조성물, 보다 구체적으로는, 뛰어난 고무적 성질과 강도 특성 및 적은 표면 태크성(tack)을 갖는 실리콘 고무로 경화되는 실리콘 고무 조성물에 관한 것이다. The present invention addition of a curable silicone rubber composition, and more particularly, relates to silicone rubber compositions which cure into silicone rubber having excellent properties and encouraging strength properties and low surface tack property (tack). 발명은 또한 그것의 표면위에 작은 먼지 부착물을 끌어들일 수 있고 낮은 탄성과 향상된 내균열성을 갖는 제품으로 경화하는 발광 반도체 피복/보호재, 및 그안에 피복된 발광 반도체 소자를 포함하는 발광 반도체 장치에 관한 것이다. Invention also relates to a light-emitting semiconductor device including a light emitting semiconductor coating / protective material, and a light emitting semiconductor element coated therein to cure the product having a dust attachment can attract and low elasticity and improved cracking resistance on its surface . 실리콘 고무 조성물은 그들이 내후 및 내열성의 유리한 성질과 경도 및 신장과 같은 뛰어난 고무적 성질을 특징으로 하는 경화된 제품을 형성하기 때문에 다양한 용도로 사용된다. Silicone rubber compositions are used in a variety of applications because they form a cured product which is characterized by excellent properties such as encouraging advantageous properties as hardness and elongation of the weather resistance and heat resistance. 그러나, 그들의 표면 태크로 인해, 먼지 부착은 그들이 전기 및 전자 부품위에서 코팅으로 사용될 때 문제가 된다. However, due to their surface tack and dust adhesion it becomes a problem when they are used as a coating on electrical and electronic components. JP-A 2001-002922 참조. See JP-A 2001-002922. 상기 문제를 해결한 실리콘 바니시는 균열 문제를 겪는다. Silicone varnish solve the problems described above undergoes a cracking problem. 전기 및 전자 부품의 패키징에 사용될 때 그것의 표면위의 먼지 부착물을 제거하고 양호한 내균열성을 갖는 경화된 제품을 형성하는 실리콘 고무 조성물을 가지는 것이 바람직할 것이다. To have a silicone rubber composition as used in the electrical and electronic components of the packaging to remove any dirt deposits on its upper surface to form a cured product having excellent crack resistance will be preferred. 일반적으로, 부가 경화형의 경화된 실리콘 고무 조성물은 수지질 오르가노폴리실록산을 배합함으로써 강도가 향상될 수 있다는 것이 당업계에 공지되어 있다. That the general, additional curing of the curable silicone rubber composition can be improved by combining the strength of the organopolysiloxane can lipid are well known in the art. 경화된 제품의 강도를 강화하기 위해서 수지질 오르가노폴리실록산의 배합이 효과적이지만, 제품은 여전히 표면 태크를 유지하며, 먼지 부착의 문제를 내포한다. Although effective, this formulation of the lipid can to enhance the strength of the cured product organopolysiloxane, the product and still maintain the surface tack, it implies a problem of dust adhering. 발광 다이오드(LED)와 같은 전통적인 발광 반도체 장치는 발광 반도체 소자가 리드 전극 위에 배치되고 투명 수지로 포탄형으로 캡슐화되는 도 3에 나타낸 바와 같은 램프형 발광 반도체장치이다. Traditional light emitting semiconductor such as a light-emitting diode (LED) device is a light emitting semiconductor device as shown in Figure 3 that the light emitting semiconductor device disposed on the lead electrode encapsulated by a transparent resin with a bullet-shaped. 그들은 최근에 장착 기술의 간소화의 결과로서 "표면 장착형"으로 대체되고 있다. They are being replaced by "surface-mounted" as a result of the simplification of mounting techniques in recent years. 오늘날 도 1과 2에 나타낸 바와 같은 표면 장착형 발광 반도체 장치가 주류로 되고 있다. Today, even a surface-mounted light-emitting semiconductor device as shown in Fig. 1 and 2 has become the mainstream. 도 1 내지 3에서, 장치는 유리 섬유 강화 에폭시 수지의 하우징(1), 발광 반도체 소자(2), 리드 전극(3)과 (4), 다이-본딩 재료(5), 금선(6), 및 피복/보호재 (7)를 포함한다. In Figures 1-3, the apparatus housing (1), a light emitting semiconductor element 2, the lead electrode 3 and 4, the die of a glass fiber reinforced epoxy resin-bonding material 5, a gold wire 6, and and a coating / protective material (7). 수지 조성물이 LED와 같은 발광 반도체 소자의 피복을 위해 사용되는 동안, 경화된 수지 조성물이 투명성을 가질 것이 요구된다. While the resin composition used for the coating of the light-emitting semiconductor element such as a LED, the cured resin composition is required to have transparency. 그러면 비스페놀 A 에폭시 수지 또는 지환식 에폭시 수지와 같은 에폭시 수지 및 산 무수물계 경화제를 포함하는 조성물이 일반적으로 사용된다(JP-A 11-274571 및 JP-A 7-025987에 해당하는 일본 특허 No. 3,241,338을 참조). The bisphenol A epoxy resin or an alicyclic epoxy resin and a composition comprising an acid anhydride-based curing agent such as epoxy resin, is usually used (JP-A 11-274571 and JP-A-7-025987 corresponding to JP No. 3,241,338 see). 그러나, 이들 투명 에폭시 수지는 높은 물의 흡수율로 인해 내습내구성이 낮고, 단파장광의 낮은 투과성으로 인해 내광내구성이 낮고, 광열화로 인해 착색하는 것을 포함하여 결점들을 가진다. However, these transparent epoxy resin is due to the high water absorption rate is low moisture durability, because of the short wavelength light-transmitting low-low internal light durability, have drawbacks, including that due to color light-to-heat furnace. 이러한 상황 하에서, 분자중에 (SiH 기와 반응성을 갖는) 적어도 2개의 탄소-대-탄소 이중 결합을 갖는 유기 화합물, 분자중에 적어도 2개의 SiH 기를 갖는 규소 화합물, 및 히드로실리에이팅 촉매를 포함하는, 광학 반도체 소자의 피복 및 보호용 수지 조성물이 제안되었다(JP-A 2002-327126 및 JP-A 2002-338833 참조). Under such circumstances, at least two carbon (having an SiH group reactive) in a molecule-to-, containing at least two silicon compounds having two SiH, and dihydro silica Exfoliating catalyst in an organic compound, the molecules having a carbon-carbon double bond optical and a protective coating resin composition of the semiconductor elements has been proposed (see JP-a 2002-327126 and JP-a 2002-338833). 유감스럽게도, 그러한 실리콘 조성물은 내균열성을 개선하기 위한 시도가 이루어질 때, 경화된 조성물은 표면 태크를 보유하므로 먼지가 표면 위에 쉽게 부착하여 광 투과성을 간섭하는 결점을 가진다. Unfortunately, it has the drawback that the interference by the light-transmitting dust is easily deposited on the surface of such a silicone composition when an attempt is made to improve the cracking resistance is made, the cured composition, so have the surface tack. 그로인해 피복과 보호 목적을 위해 고경도 실리콘 수지를 사용하는 것이 제안되었다(미국 2002-0145152에 해당하는 JP-A 2002-314139와 미국 2002-0190262에 해당하는 JP-A 2002-314143 참조). Thereby it has been proposed to use a high hardness silicone resin for covering and protection purposes (see JP-A 2002-314143 corresponding to US 2002-0145152, which corresponds to JP-A 2002-314139 and US 2002-0190262). 그러나, 고-경도 실리콘 수지는 접착성이 덜하다. However, the high-hardness silicone resin has less adhesion. 세라믹 및/또는 플라스틱 하우징에 배치된 발광소자를 포함하는 케이스에 넣은 발광 반도체 장치에서, 하우 징 내부는 실리콘 수지로 충전되고, -40℃ 내지 120 ℃ 사이에서의 열충격 시험에서 실리콘 수지가 세라믹 또는 플라스틱 하우징으로부터 분리되는 문제가 발생한다. Ceramic and / or from the semiconductor light-emitting device into the case containing the light-emitting elements arranged in a plastic housing, the housing interior is a ceramic or a plastic resin in a thermal shock test of the silicon between is filled with a silicone resin, -40 ℃ to 120 ℃ there arises a problem that separation from the housing. 또다른 문제는 SiC, GaAs, GaP, GaAsP, GaAlAs, InAlGaP, InGaN, 및 GaN과 같은 발광 소자에 사용된 다양한 화합물 반도체의 광학 결정의 굴절율이 높다는 사실로부터 생긴다. Another problem arises from the fact that high refractive index of SiC, GaAs, GaP, GaAsP, GaAlAs, InAlGaP, InGaN, and a wide variety of compounds-optic crystal of the semiconductor used in the light-emitting element such as GaN. 만약 피복/보호 수지의 굴절율이 디메틸실리콘 수지의 경우에서와 같이 낮으면, 피복 수지와 광학 결정 사이의 계면에서 광이 반사하여, 발광 효율이 낮아지는 결과를 초래한다. If the coating / if the refractive index of the protective resin is low as in the case of the dimethyl silicone resin, the light is reflected at the interface between the coated resin and the optical crystal, it results in that the luminous efficiency decreases. 그로인해 출광율을 높이기 위한 수단으로서 반사방지막을 첨가하는 것이 제안되고 있다(USP 6,614,172에 해당하는 JP-A 2001-246236 및 JP-A 2001-217467 참조). 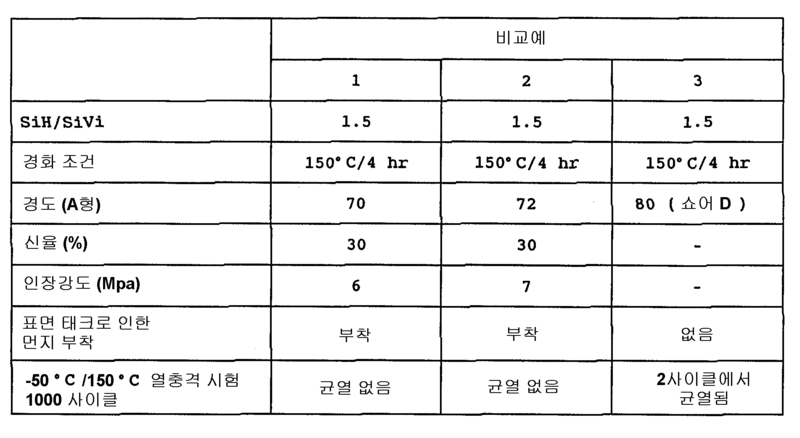 It has been proposed to thereby adding the anti-reflection film as a means for increasing the output gwangyul (see JP-A 2001-246236 and JP-A 2001-217467 corresponding to USP 6,614,172). 반사방지막의 제조는 바람직스럽지 못하게 제조 단계를 부가하고 비용이 증가시킨다. Preparation of antireflection film prevents undesirable additional manufacturing step and increases the cost. 본 발명의 목적은 신장과 같은 고무적 성질을 희생하지 않으면서 경도와 표면 태크성이 개선되는 제품으로 경화하는 부가 경화형의 실리콘 고무 조성물을 제공하는 것이다. An object of the present invention to provide a silicone rubber composition of addition curing type which is cured into products that are without sacrificing promising properties such as elongation and surface hardness improving tack property. 본 발명의 또다른 목적은 표면 태크를 제거하고 개선된 접착성, 내충격성을 가지고 광투과성이 높은 발광 반도체 피복/보호재, 및 그 안에 피복된 발광효율이 높은 발광 반도체 장치를 제공하는 것이다. A further object of the present invention is to eliminate and provide an adhesive, has a high impact resistance, a light-emitting efficiency in the light-transmitting coating is highly light emitting semiconductor coating / protective material, and the improved light-emitting semiconductor device of surface tack. 본 발명자들은 SiO 2 단위, R 3 n R 4 p SiO 0.5 단위 및 R 3 q R 4 r SiO 0.5 단위(R는 나중에 정의되는 바와 같음)를 포함하는 수지 구조의 오르가노폴리실록산의 상당량이 부가 경화형의 실리콘 고무 조성물에 배합될 때, 신장과 같은 고무적 성질을 희생하지 않고 조성물의 경도 및 표면 태크가 개선된다는 것을 발견하였다. 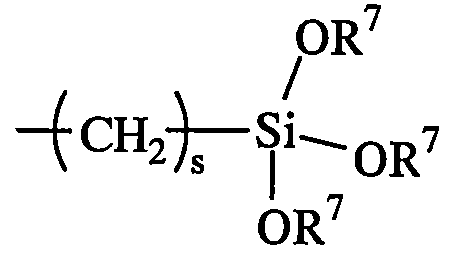 The present inventors have found that a significant amount of the organosiloxane resin structure containing SiO 2 units, R 3 n R 4 p SiO 0.5 units and R 3 q R 4 r SiO 0.5 units (R is as defined later) polysiloxane of the addition curing type It was found to be encouraging, without sacrificing properties such as elongation and hardness of the surface tack of the composition is improved when incorporated into the silicone rubber composition. 조성물은 그 위에 먼지의 부착을 방지한다. The composition to prevent adhesion of dust thereon. 특히 25℃에서 10 내지 1,000,000 mPa·s의 점도를 갖는 나중에 정의될 화학식 1의 오르가노폴리실록산이 수지 구조의 오르가노폴리실록산과 조합될 때, 경화된 상태에서 부가 경화형의 결과의 실리콘 고무 조성물은 표면 태크를 제거하고 탄성이 낮고, 투명하고 충분히 접착성이다. Especially when in 25 ℃ 10 to 1,000,000 mPa · s organopolysiloxane of formula (1) will be defined later, has a viscosity of not be combined with an organopolysiloxane of a resin structure, the silicone rubber composition of the result of the addition curing in the cured state has surface tack and removing the low elasticity, it is transparent and sufficiently adhesive. 따라서 조성물은 발광 반도체 피복/보호 재료로서 가장 적합하다. Therefore, the composition is most suitable as a light-emitting semiconductor coating / protective material. 한가지 양태에서, 본 발명은 하기를 포함하는 실리콘 고무 조성물을 제공한다. In one aspect, the invention provides a silicone rubber composition comprising the following. (B)SiO 2 단위, R 3 n R 4 p SiO 0.5 단위 및 R 3 q R 4 r SiO 0.5 단위를 포함하는 수지 구조의 오르가노폴리실록산, 상기식에서 R 3 는 (B) 2 SiO units, R 3 n R 4 p SiO 0.5 units and R 3 q R 4 r SiO resin structure organopolysiloxane, wherein R 3 in the containing 0.5 units 비닐 또는 알릴이고, R 4 는 지방족 불포화가 없는 1가 탄화수소 기이고, n은 2 또는 3이고, p는 0 또는 1이고, n+p=3이고, q는 0 또는 1이고, r은 2 또는 3이고, q+r=3이고, 성분(B)는 성분(A)와 (B)의 총 중량 기준으로 20 내지 70중량%의 양으로 존재한다. Is vinyl or allyl, R 4 is a monovalent hydrocarbon group free of aliphatic unsaturation, n is 2 or 3, p is 0 or 1, n + p = 3, q is 0 or 1, r is 2 or 3, and, and q + r = 3, the component (B) is present in an amount of components (a) and (B) a total of 20 to 70% by weight based on the weight of. (D)백금족 금속계 촉매. (D) a platinum group metal-based catalyst. 또한 위에서 정의한 실리콘 고무 조성물을 포함하는 투명 발광 반도체 피복/보호재가 제공된다. In addition, there is provided a semiconductor light-emitting material is a transparent coating / protective comprising a silicone rubber composition defined above. 전형적으로는, 성분(A)는 25℃에서 10 내지 1,000,000 mPa·s의 점도를 갖는 화학식 1의 오르가노폴리실록산이다. Typically, component (A) is an organopolysiloxane of the formula having a viscosity at 25 ℃ 10 to 1,000,000 mPa · s.
상기식에서 R 1 은 각각 독립적으로 치환 또는 비치환 1가 탄화수소 기이고, R 2 는 각각 독립적으로 지방족 불포화가 없는 치환 또는 비치환 1가 탄화수소 기이고, k와 m은 각각 0 또는 양의 정수이고, k+m은 오르가노폴리실록산이 25℃에서 10 내지 1,000,000 mPa·s의 점도를 갖도록 하는 수이다. And wherein R 1 is each independently a substituted or unsubstituted monovalent hydrocarbon group, R 2 each independently is a substituted or unsubstituted monovalent hydrocarbon group free of aliphatic unsaturation, k and m are each 0 or a positive integer, k + m is a number that the organopolysiloxane to have a viscosity at 25 ℃ 10 to 1,000,000 mPa · s.
더 나아간 양태에서, 본 발명은 개구부를 갖는 내부를 한정하는 세라믹 및/또는 플라스틱 하우징 및 하우징에 배치된 발광 반도체 소자를 포함하는 발광 반도체 장치(이때 하우징의 내부는 경화된 상태에서 피복/보호재로 충전되고); In a further aspect, the invention is filled inside the light emitting semiconductor device (where the housing including a light emitting semiconductor device disposed on the ceramic and / or plastic housing and the housing defining an interior having an opening in the cured state to the coating / protective material and); 개구부를 갖는 내부를 한정하는 세라믹 및/또는 플라스틱 하우징 및 하우징에서 리드 전극 위에 배치된 발광 반도체 소자를 포함하는 발광 반도체 장치(이때 하우징의 내 부는 경화된 상태에서 피복/보호재로 충전된다)를 제공한다. It provides a light emitting semiconductor device (this time in the inside part-cured state of the housing is filled with a coating / protective material) comprising a light emitting semiconductor device disposed on the lead electrodes in the ceramic and / or plastic housing and the housing defining an interior having an opening . 성분(A)는 분자중에 비닐과 알릴 기와 같은, 적어도 2개의 지방족 불포화 결합, 전형적으로 2 내지 8개 탄소 원자, 특히 2 내지 6개 탄소 원자의 알케닐 기를 함유하고 25℃에서 10 내지 1,000,000 mPa·s, 특히 25℃에서 100 내지 100,000mPa·s의 점도를 갖는 오르가노폴리실록산이다. Component (A), such as vinyl and allyl groups in the molecule, at least two aliphatic unsaturated bonds, typically from 2 to 8 carbon atoms, in particular 2 to 6 containing an alkenyl group of carbon atoms and 10 at 25 ℃ to 1,000,000 mPa · s, in particular from 25 ℃ organopolysiloxane having a viscosity of 100 to 100,000mPa · s. 분자 사슬의 반대쪽 말단의 각각에서 규소 원자위에 적어도 하나의 알케닐 기를 함유하고 25℃에서 10 내지 1,000,000mPa·s의 점도를 갖는 화학식 1의 선형 오르가노폴리실록산이 작업 및 경화 관점으로부터 바람직하다. 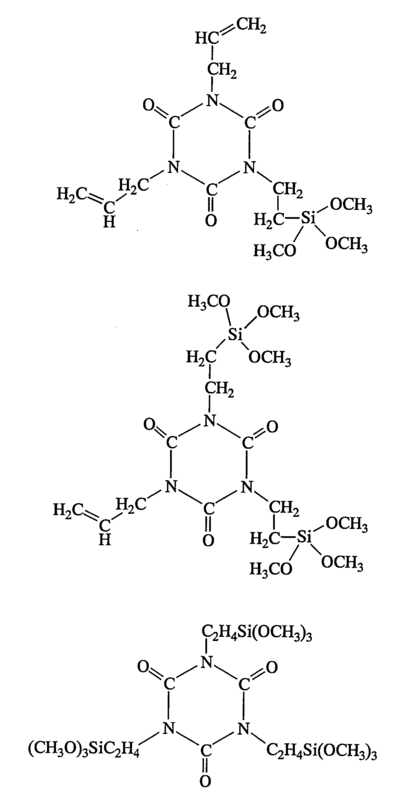 Linear organopolysiloxane of formula (1) contains at least one alkenyl group on the silicon atom at each of the opposite ends of the molecular chain and having a viscosity of from 25 to 10 ℃ 1,000,000mPa · s is preferred from the point of view operation and curing. 선형 오르가노폴리실록산은 소량의 분지형 구조 또는 3관능성 실록산 단위를 그것의 분자 사슬중에 함유할 수 있다는 것이 주목된다. 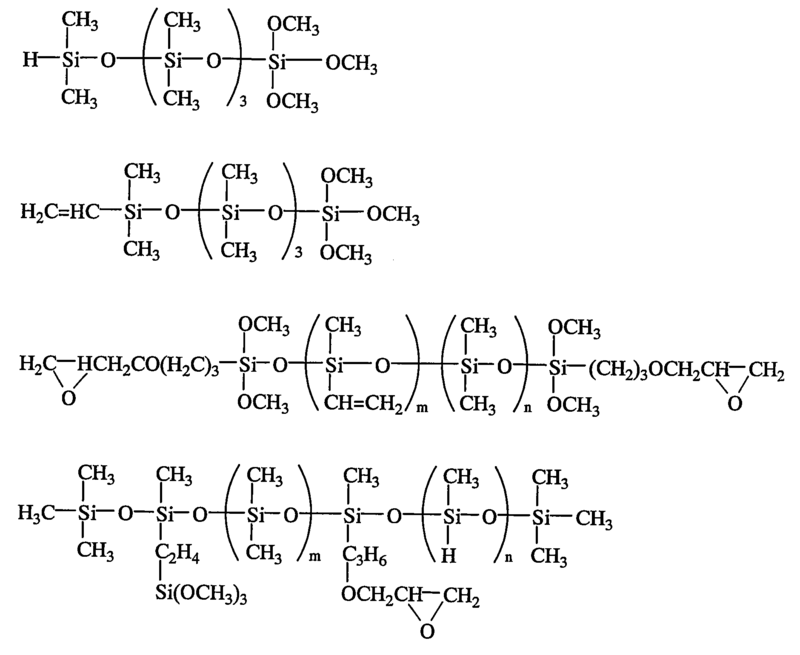 Linear organopolysiloxane is noted that a small amount of branched structure, or trifunctional siloxane units may contain in its molecular chain. 상기식에서 R 1 은 각각 독립적으로 치환 또는 비치환 1가 탄화수소 기이고, R 2 은 각각 독립적으로 지방족 불포화가 없는 치환 또는 비치환 1가 탄화수소 기이고, k와 m은 각각 0 또는 양의 정수이고, k+m은 오르가노폴리실록산이 25℃에서 10 내지 1,000,000mPa·s의 점도를 갖도록 하는 수이다. 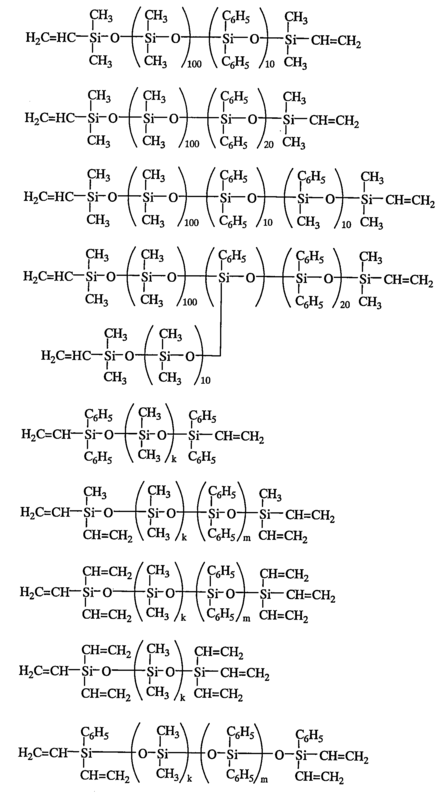 Wherein R 1 is each independently a substituted or unsubstituted monovalent hydrocarbon group, R 2 are each independently a substituted or unsubstituted monovalent hydrocarbon group free of aliphatic unsaturation, k and m are each 0 or a positive integer, k + m is the number of organo-polysiloxane at 25 ℃ to have a viscosity of from 10 to 1,000,000mPa · s.
R 1 으로 표시되는 1가 탄화수소 기는 바람직하게는 1 내지 10개 탄소 원자, 보다 바람직하게는 1 내지 6개 탄소 원자의 그것이고, 그것의 예는 메틸, 에틸, 프로필, 이소프로필, 부틸, 이소부틸, tert-부틸, 펜틸, 네오펜틸, 헥실, 시클로헥실, 옥틸, 노닐 및 데실과 같은 알킬 기, 페닐, 톨릴, 크실릴 및 나프틸과 같은 아릴 기, 벤질, 페닐에틸 및 페닐프로필과 같은 아랄킬 기, 비닐, 알릴, 프로페닐, 이소프로페닐, 부테닐, 헥세닐, 시클로헥세닐 및 옥테닐과 같은 알케닐 기, 그리고 수소 원자의 일부 또는 모두가 할로겐 원자(예를 들어, 플루오로, 브로모 및 클로로), 시아노 기 등으로 치환되는 앞서말한 기의 치환된 형태, 예를 들어, 클로로메틸, 클로로프로필, 브로모에틸 및 트리플루오로프로필, 및 시아노에틸과 같은 할로-치환된 알킬 기를 포함한다. 1 represented by R 1, hydrocarbon groups preferably having 1 to 10 carbon atoms, more preferably 1 to 6 that the carbon atom will, its examples are methyl, ethyl, propyl, isopropyl, butyl, isobutyl , tert- butyl, pentyl, neopentyl, hexyl, cyclohexyl, octyl, nonyl, and to thread such alkyl groups, phenyl, tolyl, xylyl, and aryl groups such as naphthyl, benzyl, aralkyl such as phenylethyl and phenylpropyl group, a vinyl, allyl, propenyl, isopropenyl, butenyl, hexenyl, cyclohexenyl and octenyl, and alkenyl group, and some or all of the hydrogen atoms containing a halogen atom (e.g., fluoro, bromo, such as Mo and chloro), cyano-substituted forms of the group no group such as mentioned above, which is optionally substituted by, for example, chloromethyl, chloropropyl, bromoethyl and trifluoromethyl, such as propyl, and cyanoethyl halo-substituted alkyl It includes a.
R 2 로 표시되는 1가 탄화수소 기는 바람직하게는 1 내지 10개 탄소 원자, 보다 바람직하게는 1 내지 6개 탄소 원자의 기이고, 그것의 예는 R 1 에 대해서 위에서 예시한 바와 같고, 단 알케닐 기는 배제된다. A monovalent hydrocarbon group preferably having 1 to 10 carbon atoms, more preferably one to six groups of carbon atoms represented by R 2, examples thereof are as described with respect to R 1 illustrates from above, with the proviso that the alkenyl group is excluded. 아래첨자 k와 m은 0 또는 5≤k+m≤10,000을 만족하는 양의 정수이고, 바람직하게는 10≤k+m≤2,000 및 0<k(k+m)≤0.2을 만족하는 양의 정수이다. The subscripts k and m is 0 or 5≤k + a positive integer satisfying the m≤10,000, preferably a positive integer satisfying the 10≤k m≤2,000 + and 0 <k (k + m) ≤0.2 to be. 성분(A)의 실례는 하기에 주어진다. Illustrative examples of the component (A) are given below. 본 발명의 조성물에서 필수적인 성분(B)는 SiO 2 단위, R 3 n R 4 p SiO 0.5 단위 및 R 3 q R 4 r SiO 0.5 단위(상기식에서 R 3 는 비닐 또는 알릴이고, R 4 는 지방족 불포화가 없는 1가 탄화수소 기이고, n은 2 또는 3이고, p는 0 또는 1이고, n+p=3이고, q는 0 또는 1이고, r은 2 또는 3이고, q+r=3이다)를 포함하는 수지 구조 또는 3차원 망상 구조의 오르가노폴리실록산이다. Essential component (B) in the compositions of the invention include SiO 2 units, R 3 n R 4 p SiO 0.5 units and R 3 q R 4 r SiO 0.5 units (wherein R 3 is vinyl or allyl, R 4 is an aliphatic unsaturated is a monovalent hydrocarbon group, n is 2 or 3 is not, p is 0 or 1, n + p = 3, q ​​is 0 or 1, r is 2 or 3, q ​​+ r = 3) of resin structure or three-dimensional network structure containing an organopolysiloxane. R 4 로 표시되는 1가 탄화수소 기는 R 2 에 대해 예증된 바와 같이, 바람직하게는 1 내지 10개 탄소 원자, 보다 바람직하게는 1 내지 6개 탄소 원자의 그것이다. As the one represented by R 4 exemplified for the hydrocarbon group R 2, preferably from 1 to 10 carbon atoms, more preferably that of 1 to 6 carbon atoms. c/a=0.01 내지 1, 특히 0.07 내지 0.15이다. c a / a = 0.01 to 1, particularly 0.07 to 0.15. 또한 바람직하게는, 오르가노폴리실록산(B)은 500 내지 10,000의 범위에서 중량 평균 분자량을 가진다. 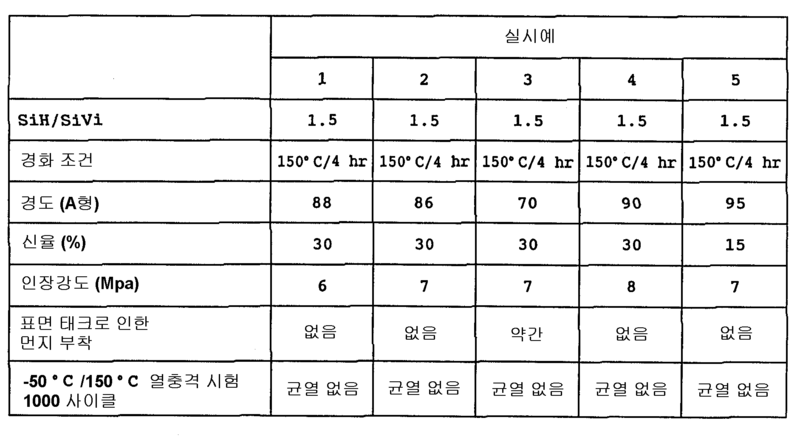 Also preferably, the organopolysiloxane (B) has a weight average molecular weight in the range of 500 to 10,000.
a,b 및 c 단위에 더하여, 수지 구조의 오르가노폴리실록산(B)은 본 발명의 목적을 손상시키지 않을 범위에서 소량으로 2관능성 실록산 단위와 3관능성 실록산 단위(즉, 유기실세스퀴옥산 단위)를 더욱 함유할 수 있다. 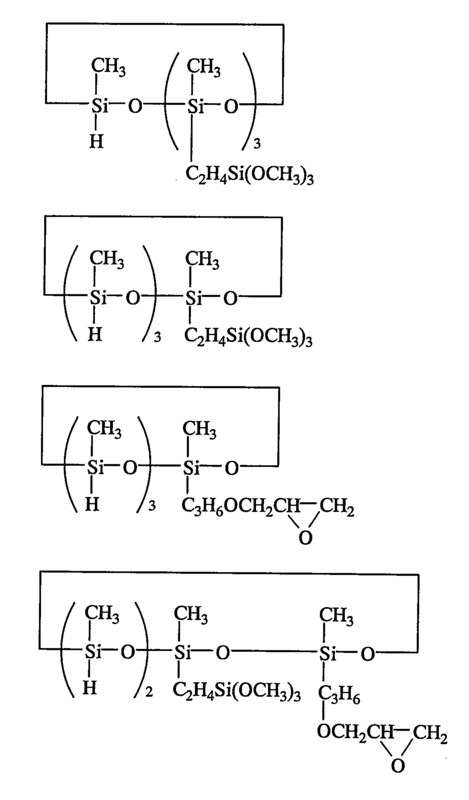 In addition to a, b and c units of organopolysiloxane (B) the resin structure is the purpose of the invention in a small amount in the not compromising range bifunctional siloxane units and trifunctional siloxane units (that is, an organic silsesquioxane It may further contain units). 수지 구조의 오르가노폴리실록산은 각각의 단위가 유도되는 화합물을 원하는 몰 비율을 제공하는 양으로 조합하고, 산의 존재하에서 공가수분해를 행함으로써 간단하게 합성될 수 있다. Organopolysiloxanes of the resin structure may be combined and in an amount to provide a molar ratio of the desired compound of each of the units derived simple synthesis by carrying out a ball hydrolysis in the presence of an acid. "a" 단위가 유도되는 화합물의 예는 나트륨 실리케이트, 알킬 실리케이트, 폴리알킬 실리케이트 및 사염화규소를 포함한다. Examples of the "a" compound unit is derived include sodium silicate, alkyl silicates, polyalkyl silicates, and silicon tetrachloride. "b" 단위가 유도되는 화합물의 예는 아래에 주어진다. Examples of the "b" compound unit is derived, it is given below. "c" 단위가 유도되는 화합물의 예는 아래에 주어진다. Examples of the compound "c" units are derived are given below. 성분(B)로서 수지 구조의 오르가노폴리실록산은 경화된 조성물의 물리적 강도와 표면 태크를 개선하기 위한 목적으로 배합된다. Component organopolysiloxanes of the resin structure as a (B) is compounded for the purpose of improving the physical strength and surface tack of the cured composition. 성분(B)는 성분(A)와 성분(B)의 총 중량을 기준으로, 20 내지 70중량%, 바람직하게는 30 내지 60 중량%의 양으로 배합된다. Component (B) is blended in an amount of components (A) and, based on the total weight of (B), 20 to 70% by weight, preferably 30 to 60% by weight. 너무 적은 양의 성분(B)는 원하는 효과를 달성하지 못하는 반면, 너무 많은 양의 성분(B)는 매우 높은 점도를 가지고 경화된 상태에서 균열이 발생하기 쉬운 조성물을 초래한다. On the other hand does not achieve the very small amount of component (B) has the desired effect of too large amounts of component (B) results in easy-to-crack in the cured state has a very high viscosity of the composition occurs. 상기식에서 R 5 는 각각 독립적으로 지방족 불포화가 없는 치환 또는 비치환 1가 탄화수소 기이고, a와 b는 0.001≤a<2, 0.7≤b≤2, 그리고 0.8≤a+b≤3를 만족하고, 분자중에 적어도 2개, 바람직하게는 적어도 3개의 규소 원자-결합된 수소 원자(즉, SiH 기)를 갖는 수이다. Wherein R 5 is each independently a substituted or unsubstituted monovalent hydrocarbon group free of aliphatic unsaturation, a and b satisfy the 0.001≤a <2, 0.7≤b≤2, and 0.8≤a + b≤3, at least two in the molecule, preferably at least three silicon atom-bonded hydrogen atoms having a number (that is, SiH groups). 화학식 2에서 R 5 는 각각 독립적으로 바람직하게는 1 내지 10개 탄소 원자, 특히 1 내지 7개 탄소 원자를 갖는 지방족 불포화가 없는 치환 또는 비치환 1가 탄화수소 기이고 , 예를 들어 메틸과 같은 저급 알킬 기, 페닐과 같은 아릴기, 및 화 학식 1에서 R 2 에 대해 위에서 예증된 것들이다. In the formula 2 R 5 are each independently preferably 1 to 10 carbon atoms, especially 1 to 7 aliphatic unsaturation is not a substituted or unsubstituted monovalent hydrocarbon group having a carbon atom groups such as lower alkyl such as methyl group, it is those exemplified above for the aryl group, and R 2 on the screen 1 of learning, such as phenyl. 아래첨자 a와 b는 0.001≤a<2, 0.7≤b≤2, 및 0.8≤a+b≤3, 바람직하게는 0.05≤a≤1, 0.8≤b≤2, 및 1≤a+b≤2.7을 만족하는 수이다. The subscripts a and b are 0.001≤a <2, 0.7≤b≤2, and 0.8≤a + b≤3, preferably 0.05≤a≤1, 0.8≤b≤2, and 1≤a + b≤2.7 It is able to satisfy. 규소 원자-결합된 수소 원자의 위치는 제약적이지 않고 분자의 말단이나 도중에 있을 수 있다. Silicon atom-bonded hydrogen atoms in position does not constrained may be end or middle of the molecule. (CH 3 ) 2 HSiO 1/2 단위와 SiO 4/2 단위로 구성되는 공중합체, 및 (CH 3 ) 2 HSiO 1/2 단위, SiO 4/2 단위, 및 (C 6 H 5 ) 3 SiO 3/2 단위로 구성되는 공중합체를 포함한다. 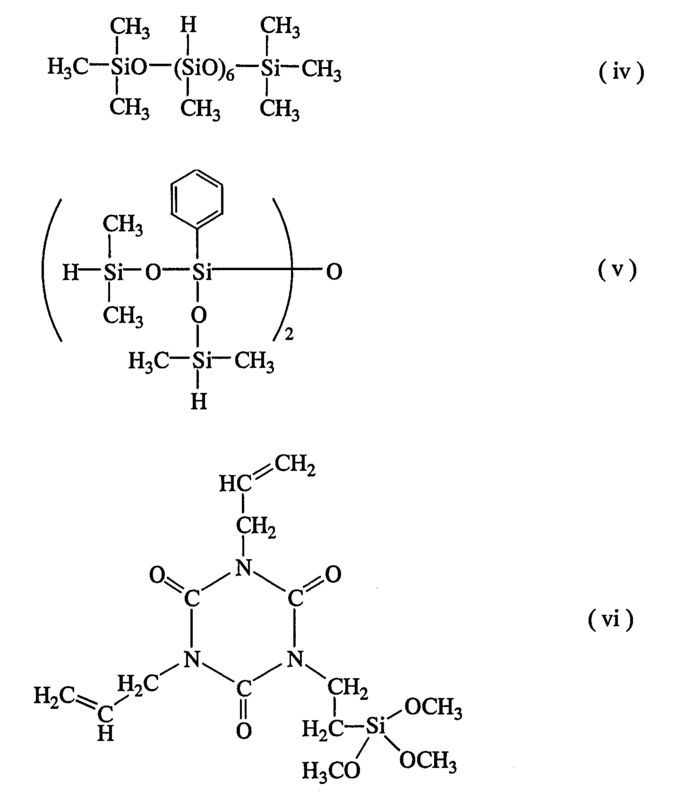 (CH 3) 2 HSiO 1/2 units, and copolymers consisting of SiO 4/2 units, and (CH 3) 2 HSiO 1/2 units, SiO 4/2 units and (C 6 H 5) 3 SiO 3 / and a copolymer consisting of two units. 또한 하기의 구조의 화합물이 유용하다. 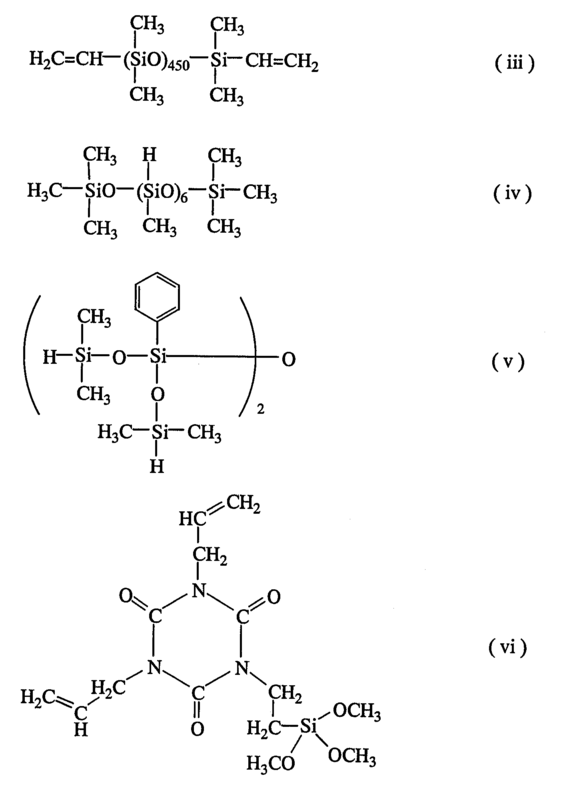 Also useful are compounds of the following structure. 오르가노하이드로겐폴리실록산의 분자 구조는 직쇄, 분지쇄, 환상 또는 3차원 망상 구조가 될 수 있다. The molecular structure of the organohydrogenpolysiloxane may be a linear, branched, cyclic or three-dimensional network structure. 분자당 규소 원자의 수 즉, 중합도는 바람직하게는 약 3 내지 약 1,000, 보다 바람직하게는 약 3 내지 약 300의 범위이다. The number of silicon atoms per molecule, i.e., degree of polymerization is preferably in the range of about 3 to about 1,000, more preferably from about 3 to about 300. 오르가노하이드로겐폴리실록산은 R 5 SiHCl 2 , (R 5 ) 3 SiCl, (R 5 ) 2 SiCl 2 , 또는 (R 5 ) 2 SiHCl (단, R 5 는 위에서 정의된 바와 같음)와 같은 클로로실란의 가수분해, 그리고 선택적으로는 가수분해로 얻어진 실록산의 평형화에 의해 얻어질 수 있다. 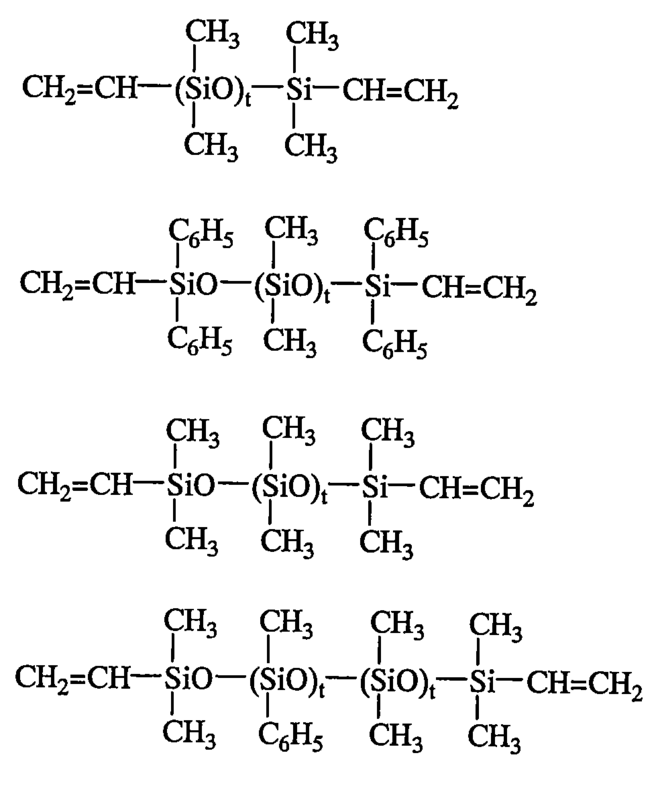 Organohydrogenpolysiloxane is R 5 SiHCl 2, (R 5 ) 3 SiCl, (R 5) 2 SiCl in the chlorosilane, such as 2, or (R 5) 2 SiHCl (However, R 5 is the same as defined above) hydrolysis, and, optionally, it may be obtained by equilibration of the siloxane obtained by hydrolysis. 오르가노하이드로겐폴리실록산(C)은 성분(A)와 (B)의 경화를 유발하는 유효량으로 배합된다. Organohydrogenpolysiloxane (C) is blended in an effective amount to induce the curing of component (A) and (B). 바람직하게는 성분 (C)는, 성분(A)와 (B) 중에 알케닐 기(전형적으로는 비닐 기)의 전체에 대해 성분(C) 중의 SiH 기의 몰비는 0.1 내지 4.0, 보다 바람직하게는 1.0 내지 3.0, 가장 바람직하게는 1.2 내지 2.8이 되도록 하는 양으로 사용된다. 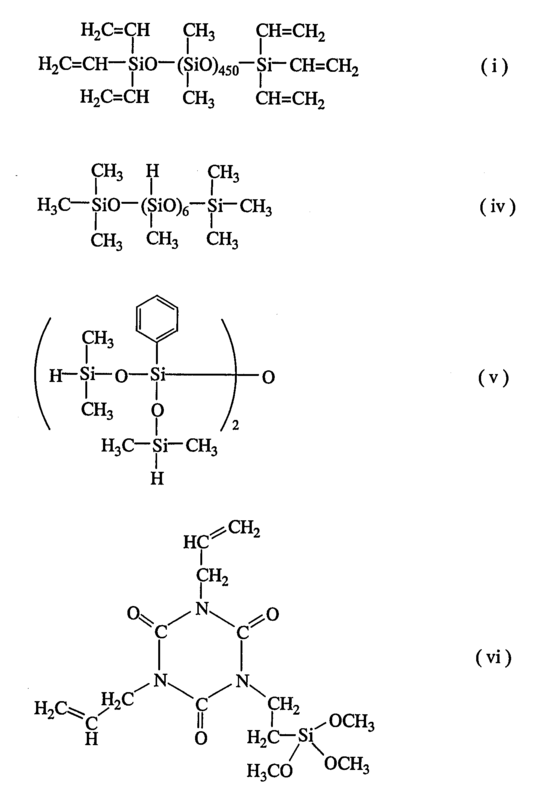 Preferably component (C), component (A) and (B) in the alkenyl group (typically vinyl group) molar ratio of the SiH group in component (C) for the whole range of 0.1 to 4.0, more preferably of to 1.0 to 3.0, and most preferably is used in an amount such that 1.2 to 2.8. 0.1 미만의 몰비는 4.0을 초과하는 몰비에서는, 상당한 양의 미반응 SiH 기가 경화된 조성물중에 남아서 경시적으로 그것의 고무 물리적 성질을 변화시킬 수 있다. Molar ratio of less than 0.1 is the molar ratio in excess of 4.0, during the stay and a significant amount of unreacted SiH groups are cured composition can change its rubber physical properties with time. 이 촉매 성분은 발명의 조성물에 부가 경화 반응을 발생시키기 위해 배합된다. The catalyst component is combined in order to generate an additional curing reaction in the composition of the invention. 백금, 팔라듐 및 로듐계 촉매가 포함된다. Platinum, include palladium and rhodium-containing catalyst. 이들 중에서, 백금, 백금 블랙 및 클로로플라틴 산과 같은 백금계 촉매가 경제적인 관점에서 바람직하다. Among these, platinum and platinum black and chloro flat Latin acids such platinum-based catalyst is preferred from an economical point of view. 특정 예는 H 2 PtCl 6 ·mH 2 O, K 2 PtCl 6 , KHPtCl 6 ·mH 2 O, K 2 PtCl 4 , K 2 PtCl 4 ·mH 2 O 및 PtO 2 ·mH 2 O(이때 m은 양의 정수이고), 및 올레핀, 알코올 및 비닐-함유 오르가노폴리실록산과 같은 탄화수소와의 그들의 착체를 포함한다. Specific examples are H 2 PtCl 6 · mH 2 O , K 2 PtCl 6, KHPtCl 6 · mH 2 O, K 2 PtCl 4, K 2 PtCl 4 · mH 2 O and PtO 2 · mH 2 O (wherein m is a positive an integer), and the olefin, alcohols and vinyl-hydrocarbon and includes their complexes, such as containing organopolysiloxane. 그들은 단독으로 또는 혼합하여 사용될 수 있다. They may be used alone or in combination. 촉매는 촉매량으로, 특히 배합된 성분 (C)~(A)의 중량 기준으로 약 0.1 내지 1,000ppm, 바람직하게는 약 0.5 내지 200 ppm의 백금 족 금속을 주는 양으로 사용될 수 있다. The catalyst may be used in an amount to give about 0.1 to 1,000ppm, preferably a platinum group metal of from about 0.5 to 200 ppm based on the weight of the amount of catalyst, in particular, the combined components (C) ~ (A). 본 발명의 조성물에서, 접착조제는 경화된 조성물의 접착성을 개선하기 위해 선택적으로 첨가될 수 있다. In the compositions of the present invention, the adhesive preparation can optionally be added to improve the adhesion of the cured composition. 적절한 접착조제는 규소 원자-결합된 알콕시 기를 갖는 오르가노실란 및 오르가노폴리실록산과 같은 유기규소 화합물이다. 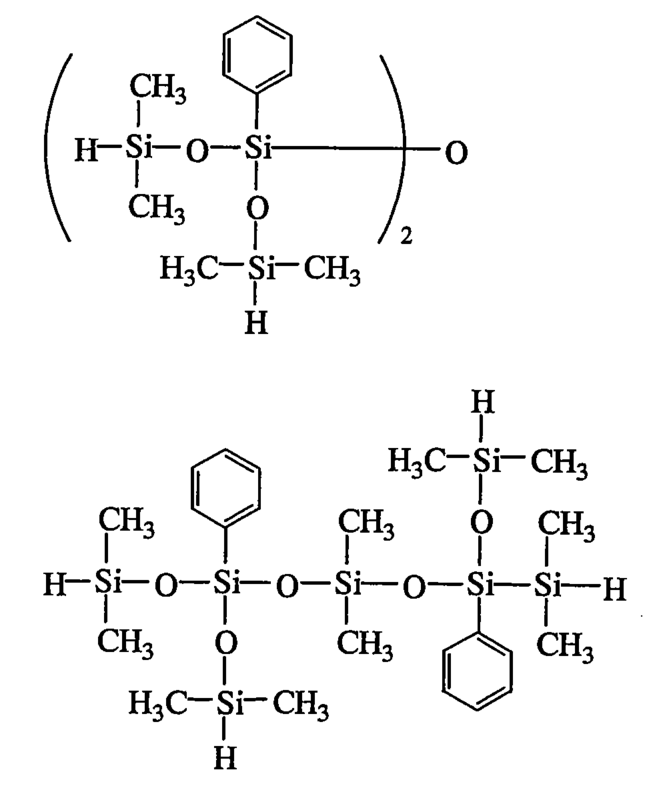 Appropriate bonding aid is a silicon atom - is an organic silicon compound such as organosilane and organopolysiloxane having a group bonded alkoxy. 유기규소 화합물의 예는 테트라메톡시실란, 테트라에톡시실란, 디메틸디메톡시실란, 메틸페닐디메톡시실란, 메틸페닐디에톡시실란, 페닐트리메톡시실란, 메틸트리메톡시실란, 메틸트리에톡시실란, 비닐트리메톡시실란, 알릴트리메톡시실란, 알릴트리에톡시실란, 3-글리시독시프로필트리메톡시실란 및 3-메타크릴옥시프로필트리메톡시실란과 같은 알콕시실란은 물론이고, 약 4 내지 약 30개 규소 원자, 특히 약 4 내지 약 20개 규소 원자를 갖고, 분자중에 규소 원자-결합된 수소 원자(SiH 기), 규소 원자-결합된 알케닐 기(예를 들어, Si-CH=CH 2 기), 알콕시실일 기(예를 들어, 트리메톡시실일과 같은 트리알콕시실일 기), 및 에폭시 기(예를 들어, 글리시독시프로필 및 3,4-에폭시시클로엑실에틸)중에서 선택된 적어도 2개, 바람직하게는 2 또는 3개의 관능기를 Examples of the organic silicon compound are tetramethoxysilane, tetraethoxysilane, dimethyldimethoxysilane, phenyl dimethoxy silane, phenyl diethoxy silane, phenyl trimethoxy silane, methyl trimethoxysilane, methyl triethoxysilane, vinyl trimethoxysilane, allyl trimethoxysilane, allyl and a trialkoxy silane such as tetraethoxysilane, 3-glycidoxypropyltrimethoxysilane, and 3-methacryloxypropyl trimethoxysilane, as well as from about 4 to about 30 silicon atoms, especially having from about 4 to about 20 silicon atoms, the silicon atoms in the molecule-bonded hydrogen atoms (SiH groups), silicon atom-bonded alkenyl groups (e.g., Si-CH = CH 2 group), an alkoxy silil group (e.g., trimethoxy work chamber such as trialkoxy silil group), and epoxy groups (e.g., glycidyl least doksi selected from propyl and 3,4-epoxy cyclohexane eksil ethyl) 2 , preferably two or three functional groups 유하는 직쇄 또는 환상 구조의 실록산 화합물(즉, 유기실록산 올리고머)을 포함한다. 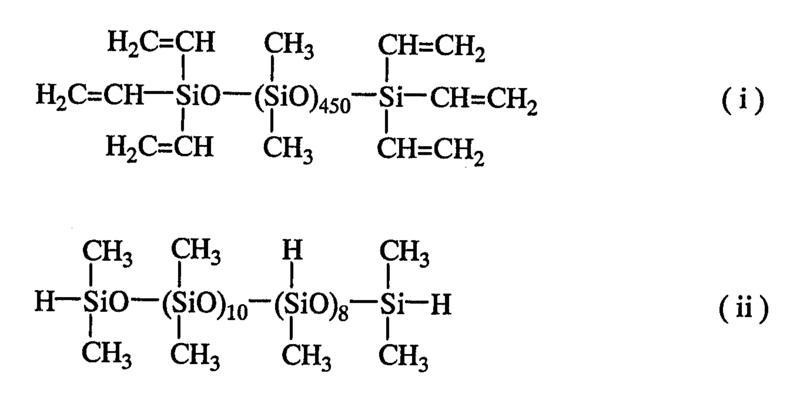 Siloxane compounds of linear chain or cyclic structure which includes an organic (i.e., organosiloxane oligomers). 바람직한 구체예에서, 화학식 3을 갖는 오르가노옥시실일-변성 이소시아누레이트 화합물 및/또는 그들의 가수분해 축합물(즉, 오르가노실록산-변성 이소시아누레이트 화합물)이 접착조제로서 사용된다. In a preferred embodiment, the Organic nook Sicily one having the formula (3) - is used as the adhesive preparation-modified isocyanurate compounds and / or their hydrolysis and condensation (modified isocyanurate compounds i.e., organosiloxanes). R 6 중 적어도 하나는 화학식 4의 유기 기이고, R 7 은 수소 또는 1 내지 6개 탄소 원자의 1가 탄화수소 기이고, s는 1 내지 6, 특히 1 내지 4의 정수이다. At least one of R 6 is an organic group of the formula 4, R 7 is a monovalent hydrocarbon group of hydrogen or one to six carbon atoms, s is an integer from 1-6, especially 1-4. R 6 에 의해 표시된 지방족 불포화 결합을 함유하는 1가 탄화수소 기의 예는 비닐, 알릴, 프로페닐, 이소프로페닐, 부테닐, 이소부테닐, 펜테닐, 헥세닐 및 시클로헥세닐과 같은, 2 내지 8개 탄소 원자, 특히 2 내지 6개 탄소 원자의 알케닐 기를 포함한다. Examples of the monovalent hydrocarbon group containing an aliphatic unsaturated bond represented by the R 6 are such as vinyl, allyl, propenyl, isopropenyl, butenyl, isobutenyl butenyl, pentenyl, hexenyl and cyclohexenyl, 2 to 8 dog include a carbon atom, in particular 2 to 6 carbon atoms, alkenyl. R 7 에 의해 표시된 1가 탄화수소 기는 예를 들어, 메틸, 에틸, 프로필, 이소프로필, 부틸, 이소부틸, tert-부틸, 펜틸, 헥실 및 시클로헥실과 같은 알킬 기, 비닐, 알릴, 프로페닐 및 이소프로페닐등의 R 6 에 대해 예증된 바와 같은 알케닐 기, 및 페닐과 같은 아릴기등의 1 내지 8개 탄소 원자, 바람직하게는 1 내지 6개 탄소 원자의 그것을 포함한다. 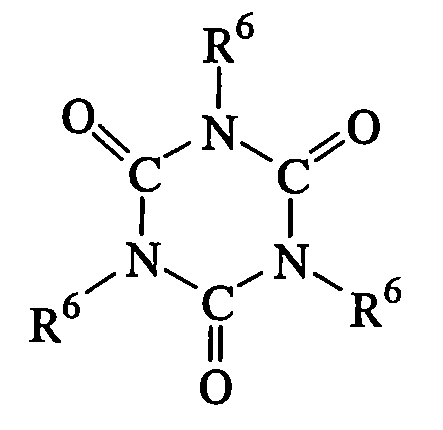 R 7 is, for example, group 1, indicated by the hydrocarbons, methyl, ethyl, propyl, isopropyl, butyl, isobutyl, tert- butyl, pentyl, hexyl and cyclohexyl groups such as alkyl, vinyl, allyl, propenyl, and isopropyl the alkenyl group as exemplified for R 6 professional, such as phenyl, and aryl groups of 1 to 8 carbon atoms, such as phenyl, and preferably contains 1 to 6 carbon atoms it. 이들 중에서, 알킬 기가 바람직하다. Of these, alkyl groups are preferred. 접착조제(E)의 예시 구체예는 하기에 주어진다. Illustrative embodiments of the adhesive auxiliary (E) are given below. 성분(E)로서 유기규소 화합물 중에서, 분자중에 규소 원자-결합된 알콕시 기 및 규소 원자-결합된 알케닐 기 또는 규소 원자-결합된 수소 원자(즉, SiH 기)을 갖는 그러한 유기규소 화합물은 경화된 조성물이 보다 접착성이기 때문에 바람직하다. 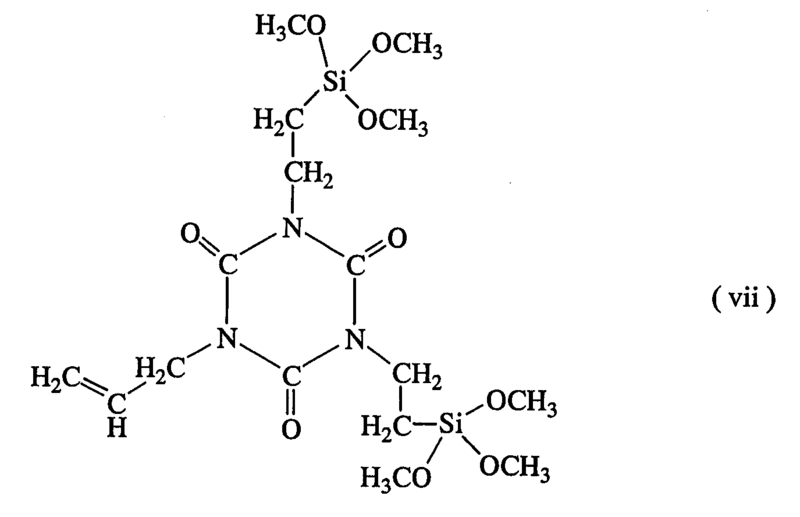 An organic silicon compound, a silicon atom in a molecule as the component (E), - bonded alkoxy groups and silicon atom-bonded alkenyl group or silicon atom-such organosilicon compound having bonded hydrogen atoms (i.e., SiH groups) is cured are preferred because the composition seongyigi than adhesive. 선택적인 성분(E)로서 접착조제는 조합된 성분(A)와 (B)의 100중량부당 0 내지 약 10중량부, 바람직하게는 약 0.01 내지 5 중량부, 보다 바람직하게는 약 0.1 내지 1 중량부의 양으로 포함된다. Adhesive prepared as an optional component (E) is 100 parts by weight 0 to about 10 parts by weight, preferably from about 0.01 to 5 parts by weight, more preferably from about 0.1 to 1 by weight of the combined components (A) and (B) It is contained in an amount of parts. 너무 적은 양의 성분(E)은 원하는 효과를 달성하지 못하는 반면에 너무 많은 양의 성분(E)은 경화된 조성물의 경도 및 표면 태크에 악영향을 줄 수 있다. Of too little component (E) is too much amount of the component on the other hand, does not achieve the desired effect (E) it may adversely affect the hardness and surface tack of the cured composition. 본 발명의 실리콘 고무 조성물은 발광 반도체 피복/보호재로서 유용하다는 것이 주목된다. Silicone rubber composition according to the present invention is noted to be useful as a light-emitting semiconductor coating / protective material. 접착조제가 위에서 기술한 바와 같이 포함될 때, 발명의 실리콘 고무 조성물은 높은 접착력 덕분에, 장착 작업 동안 수지 경화 또는 IR 환류에 의한 분리를 절대 겪지 않는다. When the adhesive preparation is to be included, as described above, the silicone rubber composition of the invention does not suffer the absolute separation by the help of high adhesion, the mounting work hardening resin or IR refluxed. 경화된 조성물은 표면 태크가 작거나 없기 때문에, 그들의 표면위에 먼지가 거의 또는 전혀 부착하지 않는다. Since the cured composition does not have the surface tack small, no dust adheres little or no over their surface. 경화된 조성물이 75이하의 Durometer A형 경도와 낮은 탄성을 가지기 때문에, 그것은 세라믹 또는 플라스틱 하우징으로부터 열팽창 계수의 차이에 의해 유발된 응력을 흡수할 수 있다. Since the cured composition have a Durometer Type A hardness of 75 or less and a low elasticity, it can absorb the stress caused by the difference in thermal expansion coefficient from the ceramic or plastic housing. 그러면 경화된 조성물은 -40℃의 저온과 120℃의 고온 사이에서 열 쇼크의 1,000 싸이클 후에도 균열이 발생하지 않는다. Then, the cured composition does not crack even after 1000 cycles of thermal shock occurs between the low temperature of -40 ℃ and 120 ℃ high temperature. 성분(A) 내지 (E)에 더하여, 본 발명 조성물은 만일 필요하다면, 그 자체로 공지된 다양한 첨가제를 더욱 함유할 수 있다. In addition to the components (A) to (E), the invention composition may further contain various additives, if necessary, known per se. 적절한 첨가제는 퓸드 실리카와 퓸드 이산화티타늄과 같은 강화 무기 충전재, 칼슘 카보네이트, 칼슘 실리케이트, 이산화티타늄, 산화제2철, 카본 블랙 및 산화아연과 같은 미-강화 무기 충전재를 포함한다. And a reinforcing inorganic filler-suitable additives such as non-reinforcing inorganic fillers, calcium carbonate, calcium silicate, titanium dioxide, oxidizing iron, carbon black and zinc oxide, such as fumed silica and fumed titanium dioxide. 이들 첨가제는 배합된 성분 (A)와 (B)의 100중량부 당 600중량부 이하의 적절한 양으로 첨가될 수 있다. These additives can be added in an appropriate amount of not more than 600 parts by weight per 100 parts by weight of the combined components (A) and (B). 본 발명의 실리콘 고무 조성물은 성분들을 친밀하게 혼합함으로써 제조된다. Silicone rubber composition of the present invention is prepared by intimately mixing the ingredients. 대부분 종종, 조성물은 경화의 진행을 막기 위해 두개의 나뉘어진 형태로 선반 저 장된다. Most often, the composition is shelf stored as two divided form in order to prevent the progression of the cure. 사용시, 두 부분이 서로 혼합되고 그 결과 경화가 일어난다. In use, the two parts being mixed together as a result undergoes curing. 물론, 포트(pot) 수명(작업가능시간)을 연장시키기 위해 아세틸렌 알코올 화합물, 트리아졸, 니트릴 화합물 또는 인 화합물과 같은 소량의 반응 억제제를 조성물에 첨가함으로써 1-부분 조성물을 제제화하는 것이 가능하다. Of course, it is possible to formulate one-part compositions by the addition of a small amount of inhibitor such as acetylene alcohol compound, a triazole compound or a nitrile compound of the composition in order to extend the port (pot) life (working time). 또한 파장 변경을 위해 인이나 산화티타늄 미세분말(TiO 2 ) 등과 같은 광산란제를 본 발명의 실리콘 고무 조성물에 첨가하는 것도 허용가능하다. It is also possible also acceptable to add the silicone rubber composition of the present the light scattering agent, such as phosphorus and titanium oxide fine powder (TiO 2) for the wavelength changing invention. 본 발명의 조성물은 만일 필요하다면, 가열함으로써 신속하게 경화하여, 높은 경도를 갖고 표면 태크가 없는 엘라스토머를 형성한다. The compositions of the present invention to quickly cured by heating, if necessary, have a high hardness to form an elastomer-free surface tack. 따라서, 조성물은 실리콘의 점착성을 피해야하는 다양한 용도, 예를 들어 전기 및 전자 부품위의 보호용 코팅, 전형적으로 실리콘 고무 키보드위의 표면 코팅으로서, 그리고 포팅 화합물, 주조 화합물, 및 몰딩 화합물에서 유용하다. Thus, the compositions are useful in various applications, for example as an electrical and a protective coating of the above electronic components, typically surface-coated on the silicon rubber keyboard, and potting compound to avoid the adhesion of the silicon, casting compounds, and molding compounds. 경화 상태는 특별히 제한적이지 않다. Curing conditions are not particularly limited. 보통 조성물은 약 5분 내지 8시간동안, 바람직하게는 약 10분 내지 4시간동안 약 60 내지 200℃, 바람직하게는 약 80 내지 180℃에서 가열함으로써 경화될 수 있다. Average composition for about 5 minutes to 8 hours, preferably about 10 minutes to about 60 to 200 ℃, preferably for 4 hours to be cured by heating at about 80 to 180 ℃. 본 발명의 실리콘 고무 조성물은 액상으로 제조될 수 있다는 것이 주목된다. Silicone rubber composition according to the present invention it is noted that the same may be prepared in the liquid phase. 특히 발광 반도체 피복/보호재로 사용될 때, 조성물은 실온에서 액상인 것이 바람직하다. In particular, when used as a light-emitting semiconductor coating / protective material, the composition is preferably a liquid at room temperature. 특히, 그것은 바람직하게는 25℃에서 약 10 내지 1,000,000 mPa·s, 특히 약 100 내지 1,000,000mPa·s의 점도를 가진다. In particular, it is preferably from about 10 to 1,000,000 mPa · s at 25 ℃, in particular has a viscosity of about 100 to 1,000,000mPa · s.
본 발명의 피복/보호재는 발광 반도체 소자의 피복과 보호를 위해 사용된다. Material is coated / protected by the present invention is used for the coating and protection of the light-emitting semiconductor element. 본 발명을 적용가능한 발광 반도체 소자는 발광 다이오드(LED), 유기 전계발광소자(유기 EL), 레이저 다이오드, 및 LED 어레이를 포함한다. The light emitting semiconductor element which can be applied to the present invention includes a light emitting diode (LED), an organic electroluminescent device (organic EL), laser diodes and LED arrays. 발광 반도체 소자를 피복하는 방법은 제한적이지 않다. Method for covering the light-emitting semiconductor device is not restrictive. 도 1과 2에서 나타낸 바와 같이, 전형적인 과정에서, 발광 반도체 소자(2)는 하우징(1)의 개구부를 갖는 하우징 내에 배치되고, 내부는 발광 반도체 소자(2)를 둘러싸기 위해 피복/보호재(7)로 충전되고, 재료는 경화된다. In a typical process, as also shown in 1 and 2, the light-emitting semiconductor device 2 is disposed in the housing having an opening in the housing (1), inside the coating / protective material (7 to surround the light emitting semiconductor elements (2) ) to be filled, the material is cured. 발명의 피복/보호재에 있어서, 경화 조건은 실온(25℃)에서 약 72시간으로부터 200℃에서 약 3분에 이르는 넓은 범위로부터 작업 조건에 따라 선택될 수 있다. In the coating / protective material of the invention, the curing conditions may be selected in accordance with the operation conditions from a wide range of up to about 3 minutes at 200 ℃ from about 72 hours at room temperature (25 ℃). 조건의 적절한 설정은 생산성과 발광 반도체 소자 및 하우징의 내열성과의 균형을 고려함으로써 결정될 수 있다. Appropriate set of conditions can be determined by considering the balance between the productivity and the light-emitting semiconductor device and a heat-resistant housing. 본 발명의 실시예들은 예시의 방식으로 하기에 주어지며 본 발명을 제한하지 않는다. Embodiment of the present invention are not limited in the present invention are given below by way of example. 모든 부는 중량부이다. All the parts are parts by weight. 점도는 25℃에서의 측정치이다. The viscosity is a measurement at 25 ℃. Me는 메틸이고 Vi는 비닐이다. Me is methyl and Vi is vinyl. 식 (i)의 폴리실록산(VF) 50부, 50mol% SiO 2 단위, 42.5mol% (CH 3 ) 3 SiO 0.5 단위 및 7.5mol% Vi 3 SiO 0.5 단위로 구성된 수지 구조 비닐메틸실록산(VMQ) 50부, VF와 VMQ 성분에 있는 비닐기의 mol 당 SiH 기 1.5mol을 제공하는 양의 식 (ii)를 갖는 오르가노하이드로겐폴리실록산, 및 옥틸 알콜-변성 클로로플라틴산 용액 0.05부를 조합하고 잘 혼합하여 실리콘 고무 조성물을 제조했다. Equation (i) a polysiloxane (VF) 50 parts, 50mol% SiO 2 units, 42.5mol% (CH 3) 3 SiO 0.5 units and 7.5mol% Vi 3 SiO 0.5 siloxane resin structure as vinyl methyl (VMQ) composed of 50 parts of units , organohydrogenpolysiloxane, and octyl alcohol having the formula amount of (ii) to provide a SiH group per mol 1.5mol of vinyl groups in the VF and VMQ components - a combination of modified-chloro flat Latin acid solution 0.05 parts and mixed well a silicone rubber composition was prepared. 조성물을 4시간 동안 150℃에서 열성형하여 경화 샘플을 형성했고, JIS K-6301에 따라서 인장강도, 경도(A형 용수철 시험기에 의해) 및 신장을 측정했다. The composition was formed by heat-curing the samples at 150 ℃ for 4 hours, according to JIS K-6301 to measure the tensile strength, hardness (by a type A spring tester) and elongation. 샘플의 표면 태크를 손가락으로 만져서 시험했다. The surface tack of the samples was tested by touching with a finger. 또한, 면 먼지 분위기에 샘플을 둔 후 꺼내어 샘플에 공기를 불어봐서 먼지 부착물이 표면에서 날아가는지의 여부를 봄으로써 표면 태크를 시험했다. Also, if looking remove dirt and then put the sample in the mood to blow air to the samples tested surface tack by looking at whether the fly dust deposits on the surface. 별도로, 조성물을 지름 6cm 깊이 0.6mm의 알루미늄 접시에 캐스트하고 경화시켜 샘플을 형성했고, 이것에 -50℃와 150℃ 사이의 열순환 시험을 행하고, 그 후에 균열을 조사했다. Separately, the composition was cast on an aluminum plate to a diameter of 6cm depth 0.6mm and cured to form a sample subjected to this heat cycle test between -50 ℃ and 150 ℃, and then examined for cracks. 결과를 표 1에 나타낸다. The results are shown in Table 1. 식 (iii)을 갖는 폴리실록산(VF)을 사용한 것을 제외하고 실시예 1에서와 같이 실리콘 고무 조성물을 제조했다. And to prepare a silicone rubber composition as in Example 1 except for using the polysiloxane (VF) having the formula (iii). 조성물을 경화시켜 샘플을 형성했고, 이것을 실시예 1에서와 같이 시험했다. Made by curing the composition to form a sample, and this test as in Example 1. 결과를 또한 표 1에 나타낸다. The results are also shown in Table 1 below. VF 70부, VMQ 30부(VF 및 VMQ는 총합하여 0.043mol/100g의 SiVi 결합을 함유한다), 오르가노하이드로겐폴리실록산 4.3부(0.74mol/100g의 SiH 기를 함유한다), 및 옥틸 알콜-변성 클로로플라틴산 용액 0.05부를 사용하여 실시예 1에서와 같이 실리콘 고무 조성물을 제조했다. VF 70 part, 30 part VMQ (contains SiH groups of 0.74mol / 100g) (VF and VMQ in total will contain a combination of the SiVi 0.043mol / 100g), 4.3 parts organohydrogenpolysiloxane, and an octyl alcohol-modified chloro sample using Latin acid solution, 0.05 parts of the silicone rubber composition was prepared as in example 1. 조성물을 경화시켜 샘플을 형성했고, 이것을 실시예 1에서와 같이 시험했다. Made by curing the composition to form a sample, and this test as in Example 1. 결과를 또한 표 1에 나타낸다. The results are also shown in Table 1 below. 50mol% SiO 2 단위, 42.5mol% (CH 3 ) 3 SiO 0.5 단위 및 7.5mol% Vi 2 MeSiO 0.5 단위로 구성된 수지 구조 비닐메틸실록산(VMQ) 50부로 VMQ 수지를 대신하고, 식 (ii)를 갖는 오르가노하이드로겐폴리실록산을 VF와 VMQ 성분에 있는 비닐기의 mol 당 SiH 기 1.5mol을 제공하는 양으로 사용하여 실시예 1에서와 같이 실리콘 고무 조성물을 제조했다. Instead of the resin portion VMQ 50mol% SiO 2 units, 42.5mol% (CH 3) 3 SiO 0.5 units and 7.5mol% Vi 2 MeSiO resin structure as vinyl methyl siloxane (VMQ) composed of 50 units of 0.5, and having a formula (ii) climb Kano hydrogen polysiloxane in an amount that provides per mol of vinyl groups in the SiH group 1.5mol VF and VMQ components to prepare a silicone rubber composition as in example 1. 조성물을 경화시켜 샘플을 형성했고, 이것을 실시예 1에서와 같이 시험했다. Made by curing the composition to form a sample, and this test as in Example 1. 결과를 또한 표 1에 나타낸다. The results are also shown in Table 1 below. 식 (i)의 폴리실록산(VF) 50부, 50mol% SiO 2 단위, 40mol% (CH 3 ) 3 SiO 0.5 단위 및 10mol% Vi 3 SiO 0.5 단위로 구성된 수지 구조 비닐메틸실록산(VMQ) 50부, VF와 VMQ 성분에 있는 비닐기의 mol 당 SiH 기 1.5mol을 제공하는 양의 식 (ii)를 갖는 오르가노하이드로겐폴리실록산, 및 옥틸 알콜-변성 클로로플라틴산 용액 0.05부를 조합하고 잘 혼합하여 실리콘 고무 조성물을 제조했다. Equation (i) of the polysiloxane (VF) 50 part, 50mol% SiO 2 units, 40mol% (CH 3) 3 SiO 0.5 units and 10mol% Vi 3 SiO 0.5 units of resin structure as vinyl methyl siloxane (VMQ) 50 parts consisting, VF and organohydrogenpolysiloxane, and octyl alcohol having the formula (ii) in an amount that provides per mol of vinyl groups in the SiH group 1.5mol VMQ components-chloro-modified silicone rubber plug Latin acid solution by combining 0.05 parts of mixed well the composition was prepared. 조성물을 4시간 동안 150℃에서 열성형하여 경화 샘플을 형성했고, 이것을 실시예 1에서와 같이 시험했다. The composition was formed by heat-curing the samples at 150 ℃ for 4 hours, it was tested as in Example 1. 결과를 또한 표 1에 나타낸다. The results are also shown in Table 1 below. 식 (iii)의 폴리실록산(VF) 50부, 50mol% SiO 2 단위, 42.5mol% (CH 3 ) 3 SiO 0.5 단위 및 7.5mol% ViMe 2 SiO 0.5 단위로 구성된 수지 구조 비닐메틸실록산(VMQ) 50부, VF와 VMQ 성분에 있는 비닐기의 mol 당 SiH 기 1.5mol을 제공하는 양의 식 (ii)를 갖는 오르가노하이드로겐폴리실록산, 및 옥틸 알콜-변성 클로로플라틴산 용액 0.05부를 조합하고 잘 혼합하여 실리콘 고무 조성물을 제조했다. Expression (iii) a polysiloxane (VF) 50 parts, 50mol% SiO 2 units, 42.5mol% (CH 3) 3 SiO 0.5 units and 7.5mol% ViMe 2-vinyl methyl siloxane resin structure (VMQ) composed of 50 parts of SiO 0.5 units , organohydrogenpolysiloxane, and octyl alcohol having the formula amount of (ii) to provide a SiH group per mol 1.5mol of vinyl groups in the VF and VMQ components - a combination of modified-chloro flat Latin acid solution 0.05 parts and mixed well a silicone rubber composition was prepared. 조성물을 4시간 동안 150℃에서 열성형하여 경화 샘플을 형성했고, 이것을 실시예 1에서와 같이 시험했다. The composition was formed by heat-curing the samples at 150 ℃ for 4 hours, it was tested as in Example 1. 결과를 또한 표 2에 나타낸다. The results are also shown in Table 2 below. 식 (i)의 폴리실록산(VF) 50부, 50mol% SiO 2 단위, 42.5mol% (CH 3 ) 3 SiO 0.5 단위 및 7.5mol% ViMe 2 SiO 0.5 단위로 구성된 수지 구조 비닐메틸실록산(VMQ) 50부, VF와 VMQ 성분에 있는 비닐기의 mol 당 SiH 기 1.5mol을 제공하는 양의 식 (ii)를 갖는 오르가노하이드로겐폴리실록산, 및 옥틸 알콜-변성 클로로플라틴산 용액 0.05부를 조합하고 잘 혼합하여 실리콘 고무 조성물을 제조했다. Equation (i) a polysiloxane (VF) 50 parts, 50mol% SiO 2 units, 42.5mol% (CH 3) 3 SiO 0.5 units and 7.5mol% ViMe 2-vinyl methyl siloxane resin structure (VMQ) composed of 50 parts of SiO 0.5 units , organohydrogenpolysiloxane, and octyl alcohol having the formula amount of (ii) to provide a SiH group per mol 1.5mol of vinyl groups in the VF and VMQ components - a combination of modified-chloro flat Latin acid solution 0.05 parts and mixed well a silicone rubber composition was prepared. 조성물을 4시간 동안 150℃에서 열성형하여 경화 샘플을 형성했고, 이것을 실시예 1에서와 같이 시험했다. The composition was formed by heat-curing the samples at 150 ℃ for 4 hours, it was tested as in Example 1. 결과를 또한 표 2에 나타낸다. The results are also shown in Table 2 below. 시판되고 있는 실리콘 바니시 KJR-632(Shin-Etsu Chemical Co., Ltd)를 유사 하게 경화시켜 경화 샘플을 형성했고, 이것을 실시예 1에서와 같이 시험했다. Similarly to cure the commercially available silicone varnish KJR-632 (Shin-Etsu Chemical Co., Ltd) that was formed in the cured sample, it was tested as in Example 1. 결과를 또한 표 2에 나타낸다. The results are also shown in Table 2 below. 식 (i)의 폴리실록산(VF) 50부, 50mol% SiO 2 단위, 42.5mol% (CH 3 ) 3 SiO 0.5 단위 및 7.5mol% Vi 3 SiO 0.5 단위로 구성된 수지 구조 비닐메틸실록산(VMQ) 50부, 식(iv)를 갖는 오르가노하이드로겐폴리실록산 8부, 식 (v)를 갖는 오르가노하이드로겐폴리실록산 5부, 식 (vi)를 갖는 접착조제 0.3부, 및 옥틸 알콜-변성 클로로플라틴산 용액 0.05부를 조합하고 잘 혼합하여 실리콘 고무 조성물을 제조했다. Equation (i) a polysiloxane (VF) 50 parts, 50mol% SiO 2 units, 42.5mol% (CH 3) 3 SiO 0.5 units and 7.5mol% Vi 3 SiO 0.5 siloxane resin structure as vinyl methyl (VMQ) composed of 50 parts of units , expression organohydrogenpolysiloxane 8 parts of formula (v) organohydrogenpolysiloxane 5 parts, the adhesive preparation 0.3 parts having the formula (vi), and octyl alcohol having having (iv) - modified chloro flat Latin acid solution a combination of 0.05 parts and mixed well to prepare a silicone rubber composition. 조성물을 4시간 동안 150℃에서 열성형하여 경화 샘플을 형성했고, JIS K-6301에 따라서 알루미늄에 대한 전단접착강도, 경도(A형 용수철 시험기에 의해) 및 신장을 측정했다. The composition was formed by heat-curing the samples at 150 ℃ for 4 hours, according to JIS K-6301 was measured shear bond strength, hardness (by a type A spring tester) and elongation for aluminum. 샘플의 표면 태크를 손가락으로 만져서 시험했다. The surface tack of the samples was tested by touching with a finger. 또한, 면 먼지 분위기에 샘플을 둔 후 꺼내어 샘플에 공기를 불어봐서 먼지 부착물이 표면에서 날아가는지의 여부를 봄으로써 표면 태크를 시험했다. Also, if looking remove dirt and then put the sample in the mood to blow air to the samples tested surface tack by looking at whether the fly dust deposits on the surface. 별도로, 조성물을 지름 6cm 깊이 0.6mm의 알루미늄 접시에 캐스트하고 경화시켜 샘플을 형성했고, 이것에 -50℃와 150℃ 사이의 열순환 시험을 행하고, 그 후에 균열을 조사했다. Separately, the composition was cast on an aluminum plate to a diameter of 6cm depth 0.6mm and cured to form a sample subjected to this heat cycle test between -50 ℃ and 150 ℃, and then examined for cracks. 결과를 표 3에 나타낸다. The results are shown in Table 3. 식 (iii)을 갖는 폴리실록산(VF)을 사용한 것을 제외하고 실시예 6에서와 같이 실리콘 고무 조성물을 제조했다. And to prepare a silicone rubber composition as in Example 6 except for using the polysiloxane (VF) having the formula (iii). 조성물을 경화시켜 샘플을 형성했고, 이것을 실시예 6에서와 같이 시험했다. It made by curing the composition to form a sample, and tested as in this embodiment six. 결과를 또한 표 3에 나타낸다. The results are also shown in Table 3 below. 식 (i)의 폴리실록산(VF) 50부, 50mol% SiO 2 단위, 40mol% (CH 3 ) 3 SiO 0.5 단위 및 10mol% Vi 3 SiO 0.5 단위로 구성된 수지 구조 비닐메틸실록산(VMQ) 50부, 식 (ii)를 갖는 오르가노하이드로겐폴리실록산 3부, 식 (iv)의 오르가노하이드로겐폴리실록산 5부, 식 (vii)를 갖는 접착조제 0.2부, 및 옥틸 알콜-변성 클로로플라틴산 용액 0.05부를 조합하고 잘 혼합하여 실리콘 고무 조성물을 제조했다. Equation (i) of the polysiloxane (VF) 50 parts, 50mol% SiO 2 units, 40mol% (CH 3) 3 SiO 0.5 units and 10mol% Vi 3 SiO resin structure as vinyl methyl siloxane (VMQ) composed of 0.5 unit of 50 parts of formula (ii) an organohydrogenpolysiloxane 3 parts of formula (iv) organohydrogenpolysiloxane 5 parts, the adhesive preparation, 0.2 parts having a formula (vii), and octyl alcohols having-modified chloro flat Latin acid solution, 0.05 parts of a combination and it was well mixed to prepare a silicone rubber composition. 조성물을 4시간 동안 150℃에서 성형하여 경화 샘플을 형성했고, 이것을 실시예 6에서와 같이 시험했다. Was molded to form a cured sample of the composition at 150 ℃ for 4 hours, it was tested as in Example 6. 결과를 또한 표 3에 나타낸다. The results are also shown in Table 3 below. 식 (iii)의 폴리실록산(VF) 50부, 50mol% SiO 2 단위, 42.5mol% (CH 3 ) 3 SiO 0.5 단위 및 7.5mol% ViMe 2 SiO 0.5 단위로 구성된 수지 구조 비닐메틸실록산(VMQ) 50부, 식 (iv)를 갖는 오르가노하이드로겐폴리실록산 8부, 식 (v)를 갖는 오르가노하이드로겐폴리실록산 5부, 식 (vi)를 갖는 접착조제 0.3부, 및 옥틸 알콜-변성 클로로플라틴산 용액 0.05부를 조합하고 잘 혼합하여 실리콘 고무 조성물을 제조했다. Expression (iii) a polysiloxane (VF) 50 parts, 50mol% SiO 2 units, 42.5mol% (CH 3) 3 SiO 0.5 units and 7.5mol% ViMe 2-vinyl methyl siloxane resin structure (VMQ) composed of 50 parts of SiO 0.5 units , expression organohydrogenpolysiloxane 8 parts of formula (v) organohydrogenpolysiloxane 5 parts, the adhesive preparation 0.3 parts having the formula (vi), and octyl alcohol having having (iv) - modified chloro flat Latin acid solution a combination of 0.05 parts and mixed well to prepare a silicone rubber composition. 조성물을 4시간 동안 150℃에서 성형하여 경화 샘플을 형성했고, 이것을 실시예 6에서와 같이 시험했다. Was molded to form a cured sample of the composition at 150 ℃ for 4 hours, it was tested as in Example 6. 결과를 또한 표 3에 나타낸다. The results are also shown in Table 3 below. 식 (i)의 폴리실록산(VF) 50부, 50mol% SiO 2 단위, 42.5mol% (CH 3 ) 3 SiO 0.5 단위 및 7.5mol% ViMe 2 SiO 0.5 단위로 구성된 수지 구조 비닐메틸실록산(VMQ) 50부, 식 (ii)를 갖는 오르가노하이드로겐폴리실록산 3부, 식 (iv)를 갖는 오르가노하이드로겐폴리실록산 5부, 식 (vii)의 접착조제 0.2부, 및 옥틸 알콜-변성 클로로플라틴산 용액 0.05부를 조합하고 잘 혼합하여 실리콘 고무 조성물을 제조했다. Equation (i) a polysiloxane (VF) 50 parts, 50mol% SiO 2 units, 42.5mol% (CH 3) 3 SiO 0.5 units and 7.5mol% ViMe 2-vinyl methyl siloxane resin structure (VMQ) composed of 50 parts of SiO 0.5 units , formula (ii) organohydrogenpolysiloxane part 3, the adhesive preparation, 0.2 parts, and octyl alcohol organohydrogenpolysiloxane 5 parts of formula (vii) having the formula (iv) with a-modified-chloro flat Latin acid solution 0.05 by combining parts and mixed well to prepare a silicone rubber composition. 조성물을 4시간 동안 150℃에서 성형하여 경화 샘플을 형성했고, 이것을 실시예 6에서와 같이 시험했다. Was molded to form a cured sample of the composition at 150 ℃ for 4 hours, it was tested as in Example 6. 결과를 또한 표 3에 나타낸다. The results are also shown in Table 3 below. 시험 결과는 본 발명의 경화 조성물이 우수한 내충격성을 가지고, 표면 태크로 인해 먼지가 부착되는 실리콘 엘라스토머의 단점을 제거한다는 것을 증명한다. Test results demonstrate that with the excellent impact resistance of the cured composition of this invention, due to the tag surface to remove the disadvantage of the silicone elastomer to cause adhesion of dust. 다음의 실시예들은 투명 발광 반도체 피복/보호재에 관한 것이다. The following examples relate to a light emitting semiconductor covered with a transparent / protective material. 먼저 실시예 및 비교예의 피복/보호재를 평가하는 시험을 설명한다. The first describes the test to evaluate the Examples and Comparative Examples coating / protective material. 식 (I)을 갖는 비닐디메틸실옥시-봉쇄 디메틸실록산/디페닐실록산 공중합체(점도 3 Pa·s) 100부, 식 (II)를 갖는 메틸수소폴리실록산(점도 15 mPa·s) 2.5부, 2-에틸헥실 알콜-변성 클로로플라틴산 용액(Pt 농도 2wt%) 0.03부, 에티닐시클로헥실 알콜 0.05부, 3-글리시드옥시프로필트리메톡시실란 7부, 및 평균 입경 9㎛를 갖는 구형 알루미나 미분 400부를 잘 혼합하여 실리콘 베이스 다이-본딩 재료를 제조했다. 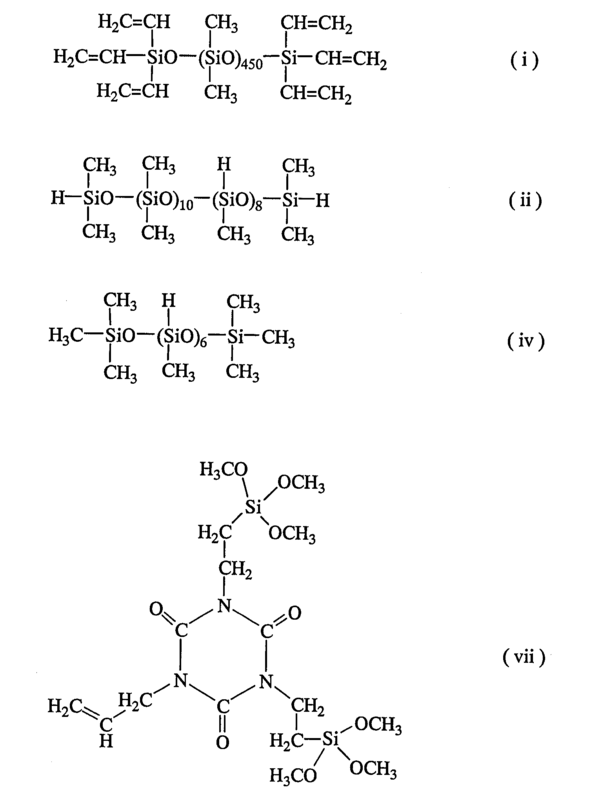 Vinyl dimethyl hexyloxy having the formula (I) - blocked dimethylsiloxane / diphenylsiloxane copolymer (viscosity of 3 Pa · s) 100 parts, expression methyl hydrogen polysiloxane having a (II) (viscosity 15 mPa · s) 2.5 parts of 2 -ethylhexyl alcohol-modified chloro flat Latin acid solution (Pt concentration 2wt%) 0.03 parts, cyclohexyl alcohol, 0.05 parts of 3-glycidoxypropyl trimethoxysilane spherical alumina having a part 7, and the average particle diameter 9㎛ ethynyl by mixing well 400 parts of fine powder of silicon-based die-bonded material it was produced. 도 1에 나타낸 발광 반도체 장치를 제작했다. FIG manufacturing the light-emitting semiconductor device shown in Fig. InGaN의 방출층을 포함하고 470nm에서 주 방출 피크를 갖는 LED 칩을 발광 소자(2)로서 사용했다. Including the emission layer of the InGaN and used the LED chip has a main emission peak at 470nm as a light emitting element (2). 발광 소자(2)를 실리콘 베이스 다이-본딩 재료(5)를 사용하여 10분간 180℃에서 가열하여, 리드 전극(3 및 4) 쌍을 갖는 유리섬유-강화 에폭시 수지로 된 하우징(1)에 고정시켰다. Fixed to the housing (1) of reinforced epoxy resin - a light emitting element (2) silicone-based die-bonding material 5 by heating at 180 ℃ 10 minutes to use, lead electrodes (3) and (4) a glass fiber having a pair It was. 금선(6)을 발광 소자(2) 및 전기 접속용 리드 전극(3 및 4)에 결합시켰다. Gold wire (6) was coupled to the light emitting element (2) and electrically connected to lead electrodes (3 and 4). 피복/보호재(7)를 하우징(1)의 내부에 넣고 1시간 동안 180℃에서 경화시켜 발광 반도체 장치를 완성했다. Into the coating / protective material (7) within the housing (1) was cured at 180 ℃ for 1 hour to complete the semiconductor light emitting device. 상기 제작된 발광 반도체 장치에 -40℃까지 냉각 120℃까지 가열의 열충격 시험을 1,000 사이클 수행했다. The thermal shock test of the heat produced in the semiconductor light emitting device 120 to the cooling ℃ to -40 ℃ performed 1,000 cycles. 샘플의 외관에서 균열을 조사했고, 균열된 샘플의 수를 기록했다. I checked out the cracks in the facade of the sample, and record the number of cracked samples. 실리카 입자가 표면에 부착되도록 실리카 분말을 상기 제작된 발광 반도체 장치에 분무했다. Silica particles were sprayed with a silica powder that adheres to the surface in the produced light-emitting semiconductor device. 장치 표면에 공기를 불어서 실리카 입자가 표면에서 날라가는지의 여부를 보았다. The blow air silica particles on the surface of the device seen whether going blown from the surface. 조성물을 4시간 동안 150℃에서 열성형하여 경화 샘플을 형성했고, JIS K-6301에 따라서 경도(A형 용수철 시험기)를 측정했다. The composition was formed by heat-curing the samples at 150 ℃ for 4 hours, to measure the hardness (A-type spring tester) according to JIS K-6301. 경화 샘플은 무색투명했다. Cured sample was a colorless transparent. 결과를 또한 표 4에 나타낸다. The results are also shown in Table 4. 이 고무 조성물을 사용하여 상기와 같이 발광 반도체 장치를 제작했다. Using a rubber composition was prepared a light-emitting semiconductor device as described above. 식 (iii)을 갖는 폴리실록산(VF)을 사용한 것을 제외하고 실시예 9에서와 같이 실리콘 고무 조성물을 제조했다. And to prepare a silicone rubber composition as in Example 9 except for using the polysiloxane (VF) having the formula (iii). 조성물을 경화시켜 샘플을 형성했고, 이것을 실시예 9에서와 같이 시험했다. Made by curing the composition to form a sample, and this test as in Example 9. 결과를 또한 표 4에 나타낸다. The results are also shown in Table 4. 경화 샘플은 무색투명했다. Cured sample was a colorless transparent. 이 고무 조성물을 사용하여 상기와 같이 발광 반도체 장치를 제작했다. Using a rubber composition was prepared a light-emitting semiconductor device as described above. 폴리실록산(VF) 70부, 50mol% SiO 2 단위, 42.5mol% (CH 3 ) 3 SiO 0.5 단위 및 7.5 mol% Vi 2 MeSiO 0.5 단위로 구성된 수지 구조 비닐메틸실록산(VMQ) 30부, 및 식 (ii)의 오르가노하이드로겐폴리실록산 10부를 사용하여 실시예 9에서와 같이 실리콘 고무 조성물을 제조했다. Polysiloxane (VF) unit 70, 50mol% SiO 2 units, 42.5mol% (CH 3) 3 SiO 0.5 units and 7.5 mol% Vi 2-vinyl methyl siloxane resin structure (VMQ) composed of 30 parts of MeSiO 0.5 units, and the formula (ii ) and organohydrogenpolysiloxane used 10 parts of the silicone rubber composition was prepared as in example 9. 조성물을 샘플로 경화시켰고, 이것을 실시예 9에서와 같이 시험했다. Sikyeotgo cure the composition to the sample, it was tested as in Example 9. 결과를 또한 표 4에 나타낸다. The results are also shown in Table 4. 경화 샘플은 무색투명했다. Cured sample was a colorless transparent. 이 고무 조성물을 사용하여 상기와 같이 발광 반도체 장치를 제작했다. Using a rubber composition was prepared a light-emitting semiconductor device as described above. 식 (i)의 폴리실록산(VF) 50부, 50mol% SiO 2 단위, 40mol% (CH 3 ) 3 SiO 0.5 단위 및 10mol% Vi 3 SiO 0.5 단위로 구성된 수지 구조 비닐메틸실록산(VMQ) 50부, 식 (ii)를 갖는 오르가노하이드로겐폴리실록산 8부, 식 (iv)의 오르가노하이드로겐폴리실록산 5부, 식 (vii)를 갖는 접착조제 0.2부, 및 옥틸 알콜-변성 클로로플라틴산 용액 0.05부를 조합하고 잘 혼합하여 실리콘 고무 조성물을 제조했다. Equation (i) of the polysiloxane (VF) 50 parts, 50mol% SiO 2 units, 40mol% (CH 3) 3 SiO 0.5 units and 10mol% Vi 3 SiO resin structure as vinyl methyl siloxane (VMQ) composed of 0.5 unit of 50 parts of formula (ii) an organohydrogenpolysiloxane 8 parts of formula (iv) organohydrogenpolysiloxane 5 parts, the adhesive preparation, 0.2 parts having a formula (vii), and octyl alcohols having-modified chloro flat Latin acid solution, 0.05 parts of a combination and it was well mixed to prepare a silicone rubber composition. 조성물을 4시간 동안 150℃에서 열성형하여 경화 샘플을 형성했고, 이것을 실시예 9에서와 같이 시험했다. The composition was formed by heat-curing the samples at 150 ℃ for 4 hours, it was tested as in Example 9. 결과를 또한 표 4에 나타낸다. The results are also shown in Table 4. 경화 샘플은 무색투명했다. Cured sample was a colorless transparent. 이 고무 조성물을 사용하여 상기와 같이 발광 반도체 장치를 제작했다. Using a rubber composition was prepared a light-emitting semiconductor device as described above. 식 (iii)의 폴리실록산(VF) 50부, 50mol% SiO 2 단위, 42.5mol% (CH 3 ) 3 SiO 0.5 단위 및 7.5mol% ViMe 2 SiO 0.5 단위로 구성된 수지 구조 비닐메틸실록산(VMQ) 50부, 식 (iv)를 갖는 오르가노하이드로겐폴리실록산 8부, 식 (v)를 갖는 오르가노하이드로겐폴리실록산 5부, 식 (vi)를 갖는 접착조제 0.3부, 및 옥틸 알콜-변성 클로로플라틴산 용액 0.05부를 조합하고 잘 혼합하여 실리콘 고무 조성물을 제조했다. Expression (iii) a polysiloxane (VF) 50 parts, 50mol% SiO 2 units, 42.5mol% (CH 3) 3 SiO 0.5 units and 7.5mol% ViMe 2-vinyl methyl siloxane resin structure (VMQ) composed of 50 parts of SiO 0.5 units , expression organohydrogenpolysiloxane 8 parts of formula (v) organohydrogenpolysiloxane 5 parts, the adhesive preparation 0.3 parts having the formula (vi), and octyl alcohol having having (iv) - modified chloro flat Latin acid solution a combination of 0.05 parts and mixed well to prepare a silicone rubber composition. 식 (i)의 폴리실록산(VF) 50부, 50mol% SiO 2 단위, 42.5mol% (CH 3 ) 3 SiO 0.5 단위 및 7.5mol% ViMe 2 SiO 0.5 단위로 구성된 수지 구조 비닐메틸실록산(VMQ) 50부, 식 (ii)를 갖는 오르가노하이드로겐폴리실록산 3부, 식 (iv)의 오르가노하이드로겐폴리실록산 5부, 식 (vii)를 갖는 접착조제 0.2부, 및 옥틸 알콜-변성 클로로플라틴산 용액 0.05부를 조합하고 잘 혼합하여 실리콘 고무 조성물을 제조했다. Equation (i) a polysiloxane (VF) 50 parts, 50mol% SiO 2 units, 42.5mol% (CH 3) 3 SiO 0.5 units and 7.5mol% ViMe 2-vinyl methyl siloxane resin structure (VMQ) composed of 50 parts of SiO 0.5 units , formula (ii) organohydrogenpolysiloxane 3 parts organohydrogenpolysiloxane 5 parts, the adhesive preparation, 0.2 parts having a formula (vii), and octyl alcohol of formula (iv) with a-modified-chloro flat Latin acid solution 0.05 by combining parts and mixed well to prepare a silicone rubber composition. 시판되고 있는 실리콘 바니시 KJR-632(Shin-Etsu Chemical Co., Ltd)를 유사하게 경화시켜 경화 샘플을 형성했고, 이것을 실시예 9에서와 같이 시험했다. Similarly to cure the commercially available silicone varnish KJR-632 (Shin-Etsu Chemical Co., Ltd) that was formed in the cured sample, it was tested as in Example 9. 결과를 또한 표 4에 나타낸다. The results are also shown in Table 4. 경화 샘플은 무색투명했다. Cured sample was a colorless transparent. 이 바니시를 사용하여 상기와 같이 발광 반도체 장치를 제작했다. Using this varnish to prepare a light-emitting semiconductor device as described above. 실시예 9 내지 12와 비교예 6 내지 8의 실리콘 고무 조성물 및 바니시를 사용하여 발광 반도체 소자를 캡슐화했다. Examples 9 to 12 and Comparative Examples 6 to 8 and using a silicone rubber composition and a varnish of a light-emitting semiconductor device was encapsulated. 장치 특성을 평가했다. To evaluate the device characteristics. 표 4는 실시예 및 비교예의 피복/보호재의 시험 결과를 나타낸다. Table 4 shows the test results of Examples and Comparative Examples, coating / protective material. 발광 반도체 소자가 본 발명의 재료로 피복되고 보호된 발광 반도체 장치는 거의 변색되지 않으며, 가열 시험에서 높은 방출 효능을 유지한다. A light emitting semiconductor element is coated with a composition of the invention protected the light-emitting semiconductor device is hardly discolored, maintaining the high emission efficiency in the heating test. 긴 수명 및 에 너지 절약을 특징으로 하는 발광 반도체 장치를 제공하는 본 발명은 대단한 산업적 가치를 가진다. The present invention to provide a light emitting semiconductor device, characterized by energy saving and long life has a great industrial value. 를 포함하며, 성분 (B)는 성분 (A)와 (B)의 총 중량 기준으로 20 내지 70중량%의 양으로 존재하며, 성분 (C)의 양은 성분(A) 및 성분(B) 중의 알케닐기의 합계량당 성분(C)중의 SiH기가 0.1~4.0의 몰비로 되는 양이며, 성분 (D)의 양은 성분 (A)~(C)의 합계에 대해서 백금족 금속 환산(중량)으로 0.1~1,000 ppm이 되는 양인 것을 특징으로 하는 실리콘 고무 조성물. Comprises a component (B) is component (A) and (B) an alkenyl of the total weight between 20 and present in an amount of 70% by weight, the amount of components of the component (C) (A) and component (B) of the amount of SiH in component (C) per the total amount of the group groups are in a molar ratio of 0.1 to 4.0, a component (D) amount of components (a) ~ a platinum group metal in terms of (parts by weight) with respect to the total of (C) of 0.1 to 1,000 ppm silicone rubber composition of a quantity characterized in that a. 제 1 항에 있어서, 성분 (A)는 다음 화학식 1을 갖는 오르가노폴리실록산인 것을 특징으로 하는 실리콘 고무 조성물. 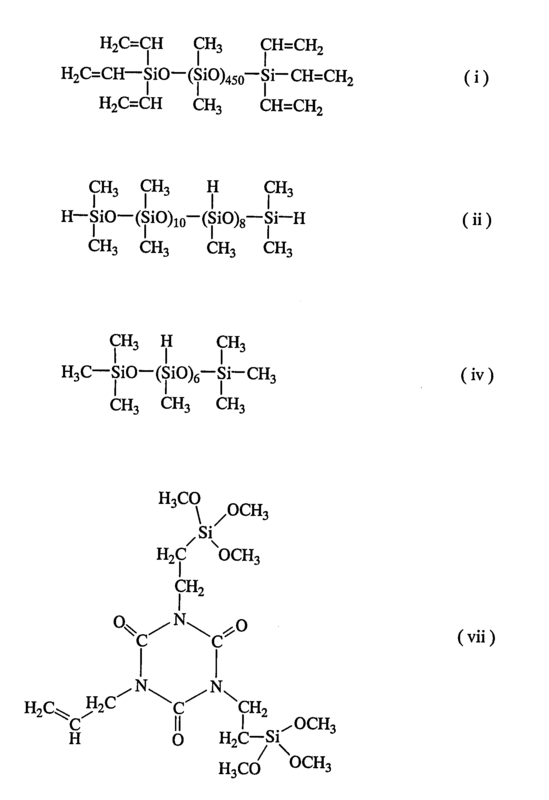 The method of claim 1, wherein component (A) are the following silicone rubber composition which is characterized in that the organopolysiloxane having the general formula (1). 상기 식에서, R 1 은 각각 독립적으로 치환 또는 비치환 1가 탄화수소기이고, R 2 는 각각 독립적으로 지방족 불포화가 없는 치환 또는 비치환 1가 탄화수소기이고, k와 m은 각각 0 또는 양의 정수이고, k+m은 오르가노폴리실록산이 25℃에서 10 내지 1,000,000 mPa·s의 점도를 갖도록 하는 수이다. Wherein R, R 1 are each independently a substituted or unsubstituted monovalent hydrocarbon group, R 2 are each independently an aliphatic unsaturation-free substituted or unsubstituted monovalent hydrocarbon group, k and m are each 0 or a positive integer , k + m is a number that the organopolysiloxane to have a viscosity at 25 ℃ 10 to 1,000,000 mPa · s.
제 1 항에 있어서, (E) 접착조제를 더 포함하며, 상기 성분(E)의 양은 성분(A), (B)의 합계 100질량부에 대해서 0.01~10질량부인 것을 특징으로 하는 실리콘 고무 조성물. According to claim 1, (E) further comprising a bonding aid, a silicone rubber composition, wherein 0.01 to 10 parts by mass with respect to the total 100 parts by mass of the amount of component (A), (B) of the component (E) . 제 3 항에 있어서, 접착조제 (E)는 하기 화학식 3을 갖는 이소시아누레이트 화합물, 또는 그들의 가수분해 축합물, 또는 둘 모두인 것을 특징으로 하는 실리콘 고무 조성물. The method of claim 3 wherein the adhesive auxiliary (E) to the silicone rubber composition of an isocyanurate compound, or a product of hydrolysis and condensation, or both, characterized in that both with the formula (3). 또는 지방족 불포화 결합을 함유하는 1가 탄화수소기이며, R 6 중 적어도 하나는 화학식 4의 유기기이고, R 7 은 수소 또는 1 내지 6개 탄소 원자의 1가 탄화수소기이고, s는 1 내지 6의 정수이다. Or a monovalent hydrocarbon group containing an aliphatic unsaturated bond, R, at least one of the six is the organic group of the formula 4, R 7 is a monovalent hydrocarbon group of hydrogen or one to six carbon atoms, s is from 1 to 6 It is an integer. 제 1 항 내지 제 4 항 중 어느 한 항의 실리콘 고무 조성물을 포함하는 투명 발광 반도체 피복/보호재. Wherein the first to fourth transparent light-emitting semiconductor coating / protective material containing any one of the silicone rubber composition of the claims. 개구부 내부를 한정하는 세라믹 또는 플라스틱 하우징 및 이 하우징내에 배치된 발광 반도체 소자를 포함하고, 하우징의 내부는 경화된 상태의 제 5 항의 피복/보호재로 충전되는 발광 반도체 장치. Ceramic or plastic housing and the interior of the light emission such as semiconductor devices, and the housing is filled with a light-emitting semiconductor device of claim of claim 5, the cured coating condition / protective material disposed in a housing which defines an internal opening. 개구부 내부를 한정하는 세라믹 또는 플라스틱 하우징 및 이 하우징내의 리드 전극 위에 배치된 발광 반도체 소자를 포함하고, 하우징의 내부는 경화된 상태의 제 5 항의 피복/보호재로 충전되는 발광 반도체 장치. Ceramic or plastic housing and including the interior of a light emitting semiconductor device disposed on the lead electrodes, and the housing is filled with a light-emitting semiconductor device of claim of claim 5, the cured coating condition / protective material within a housing which defines an internal opening.